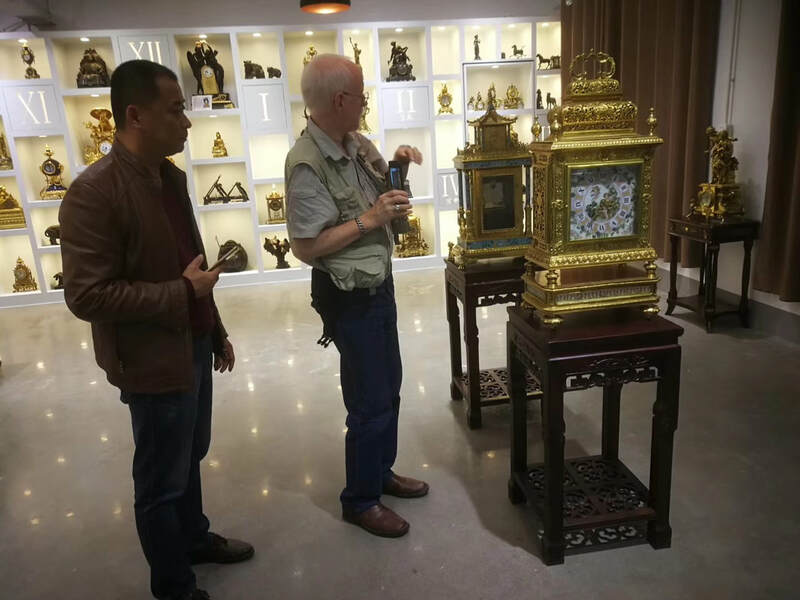 After a wonderful time in Shanghai, it was time to leave. 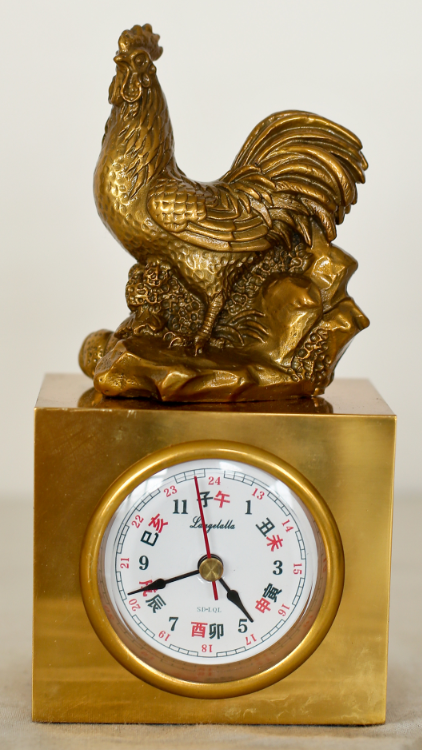 That meant getting up early to fly China Eastern out of Shanghai Pudong airport, headed for Liaocheng, Shandong. 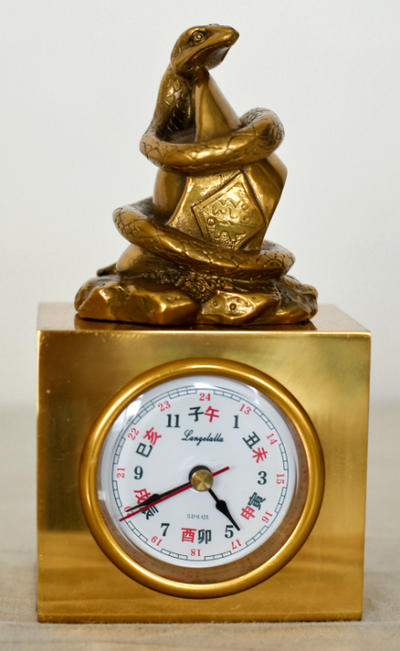 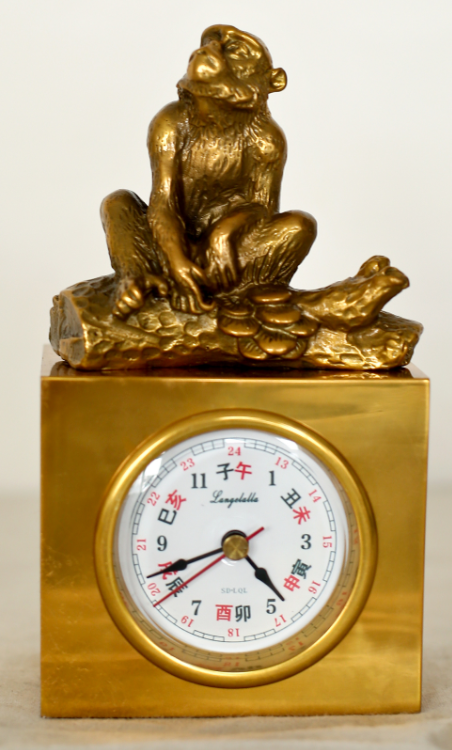 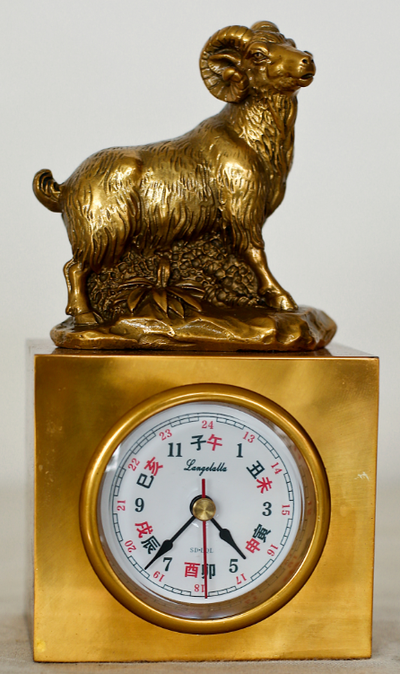 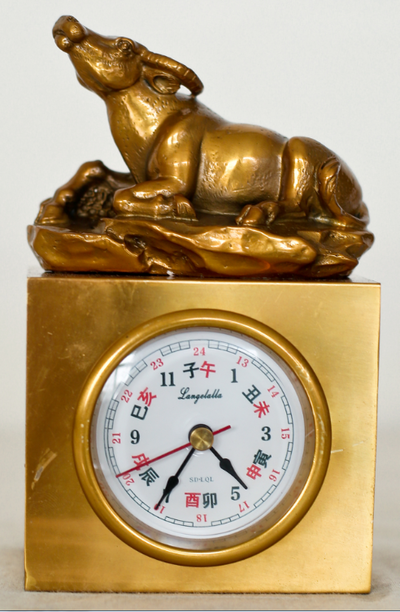 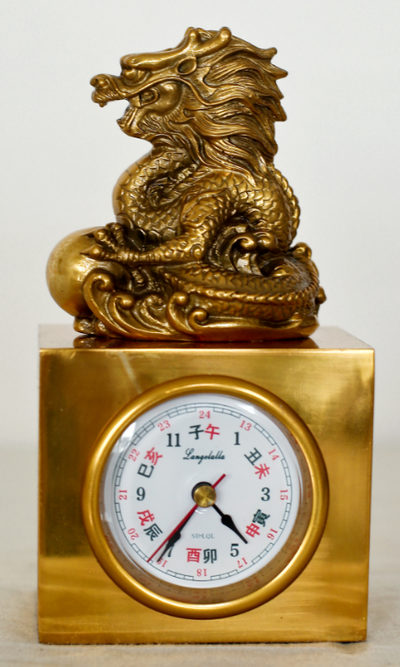 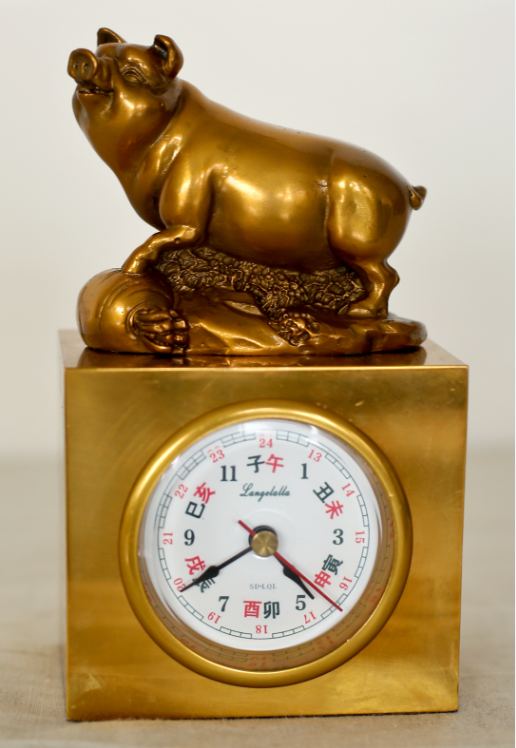 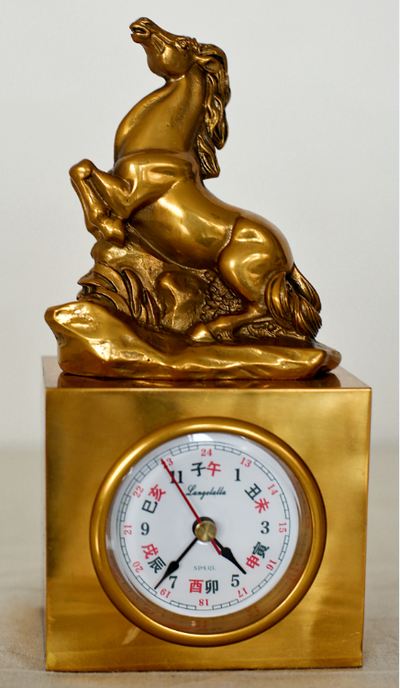 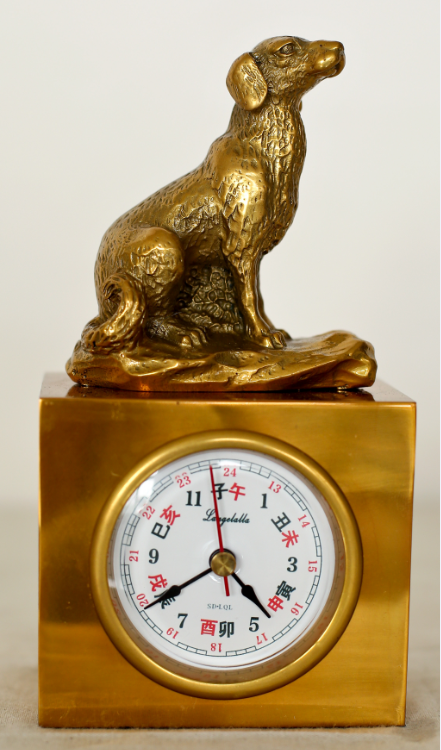 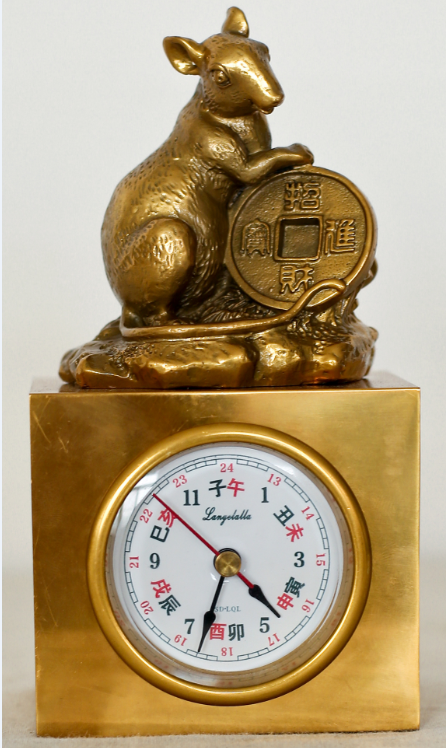 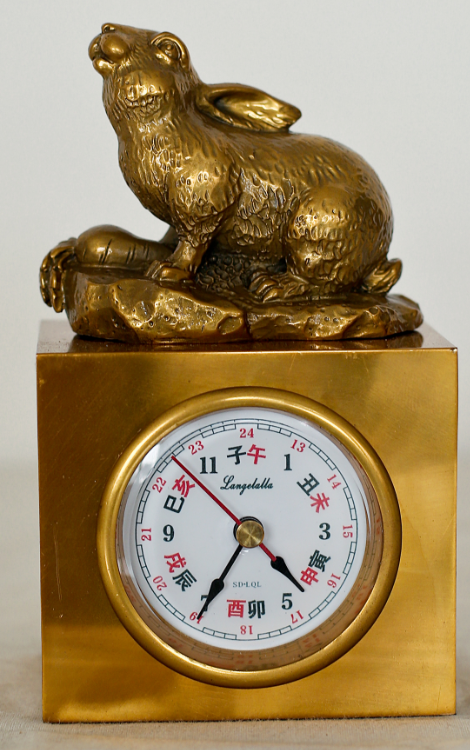 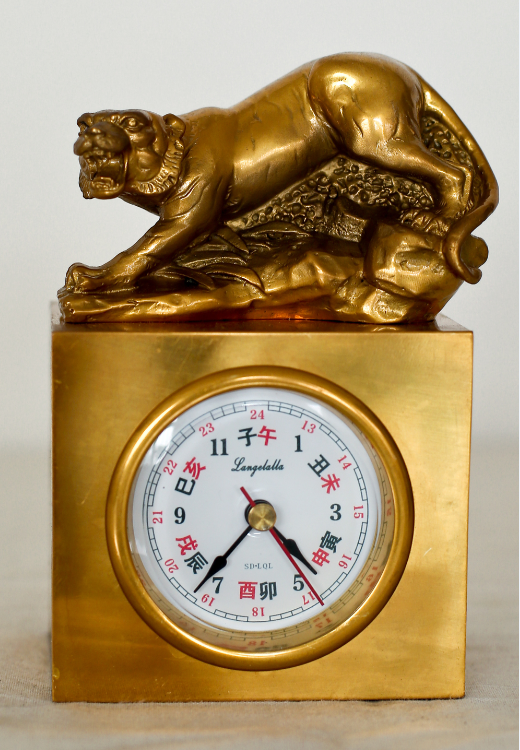 Liaocheng is home to Shandong Langelo Arts & Crafts Co., Ltd., a unique manufacturer of mechanical and quartz clocks that I had visited in 2015. 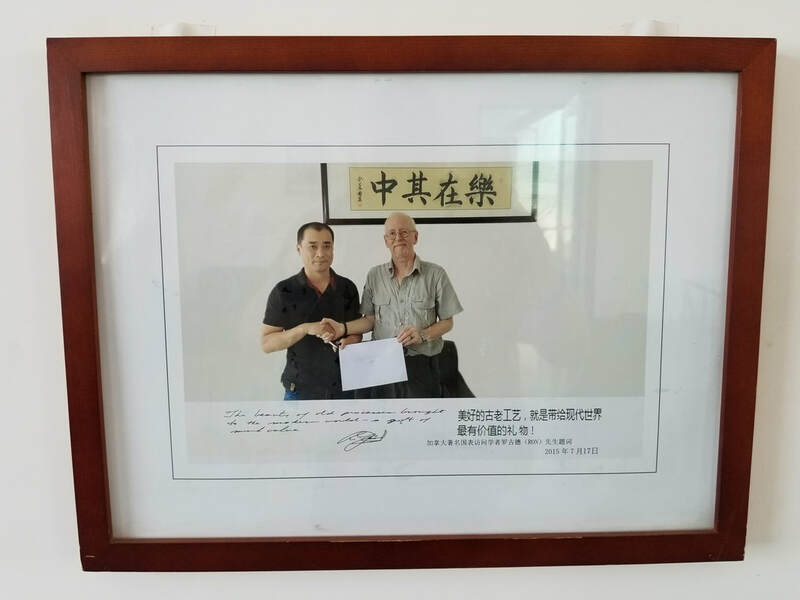 I was very much looking forward to re-meeting the Company's Manager, Ma Xian Ming. 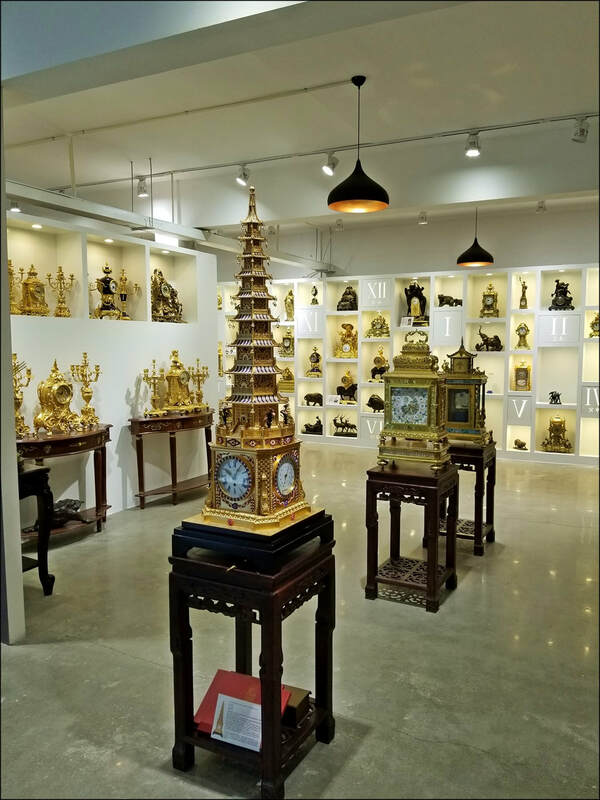 He and his co-workers had shown me warm hospitality on my last visit, and I was eager to gather new and updated photos and video to show the company's remarkable products: recreations of 17th and 18th century clocks, hand made using the traditional lost wax and metals handling techniques of that period. 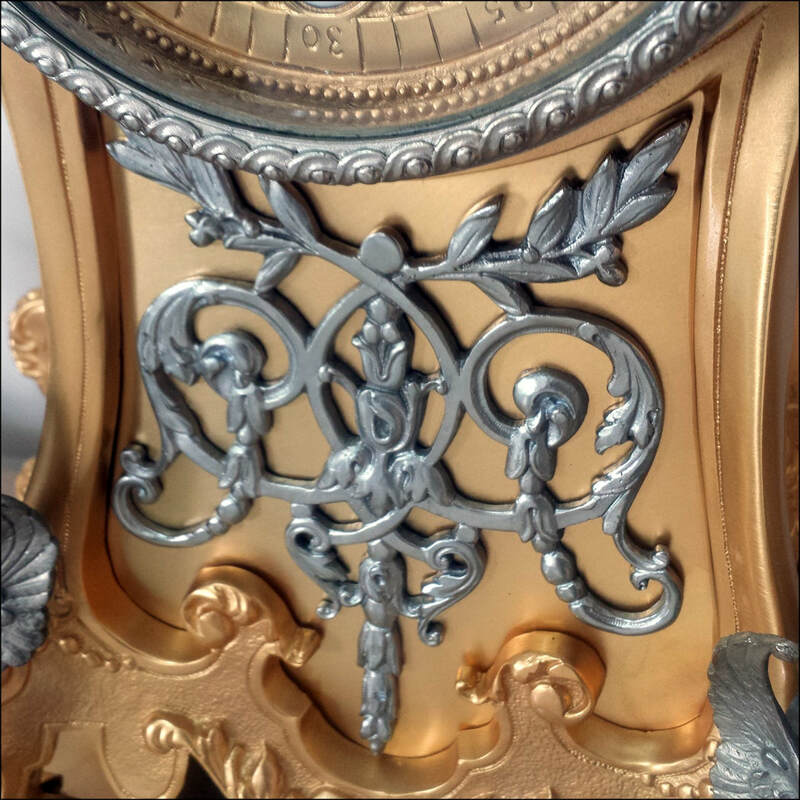 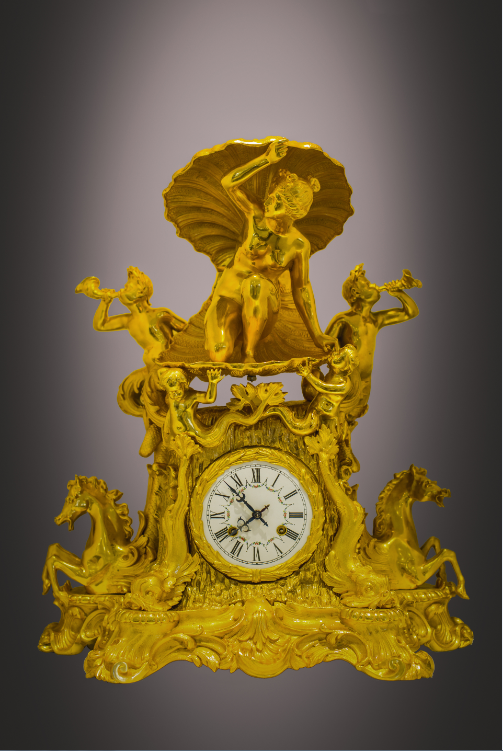 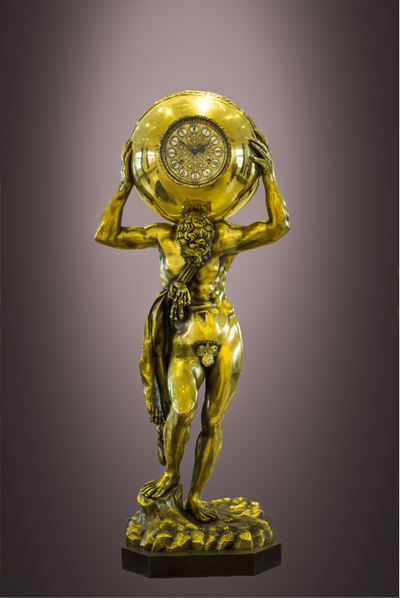 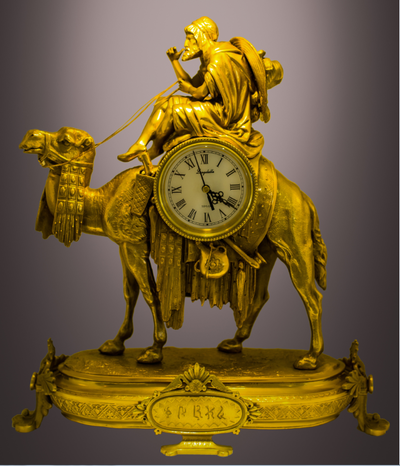 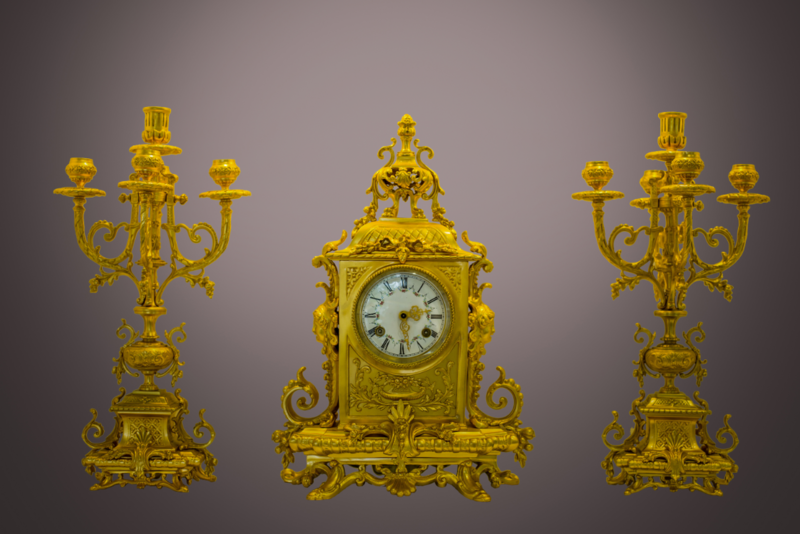 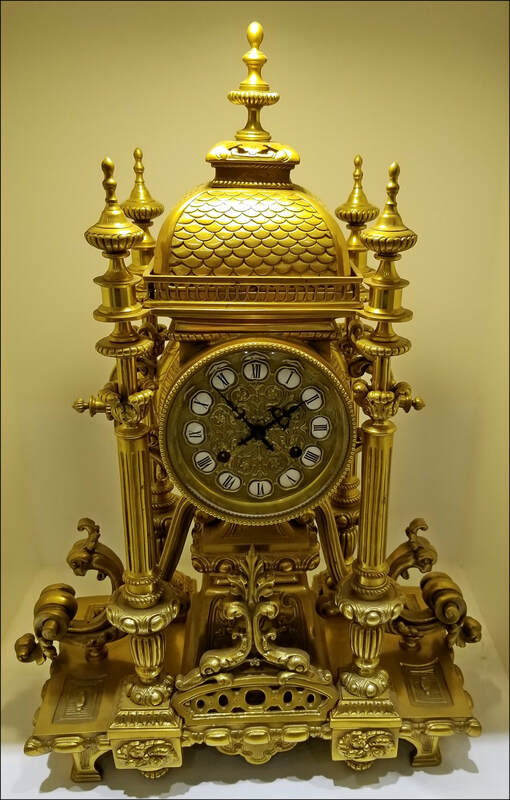 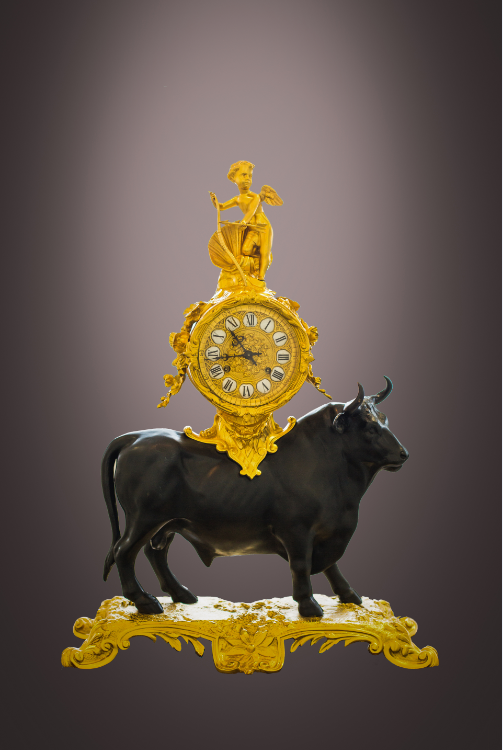 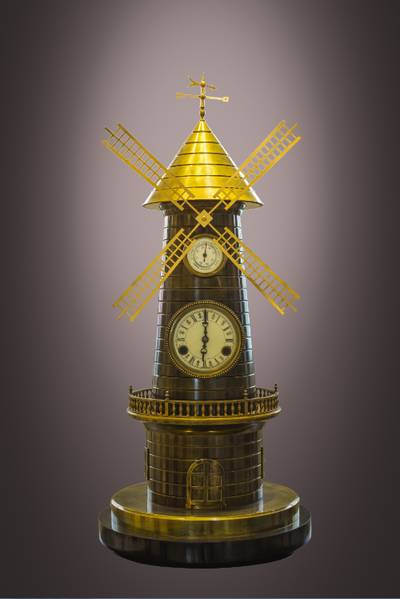 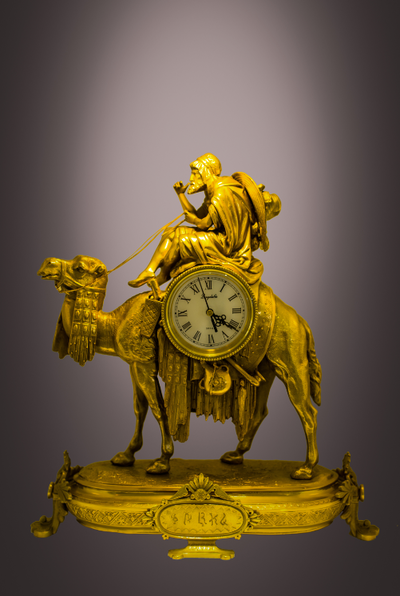 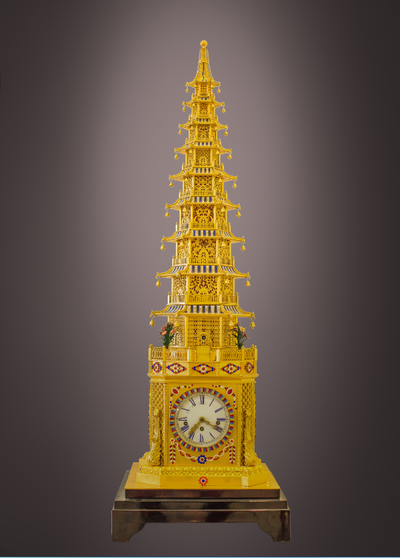 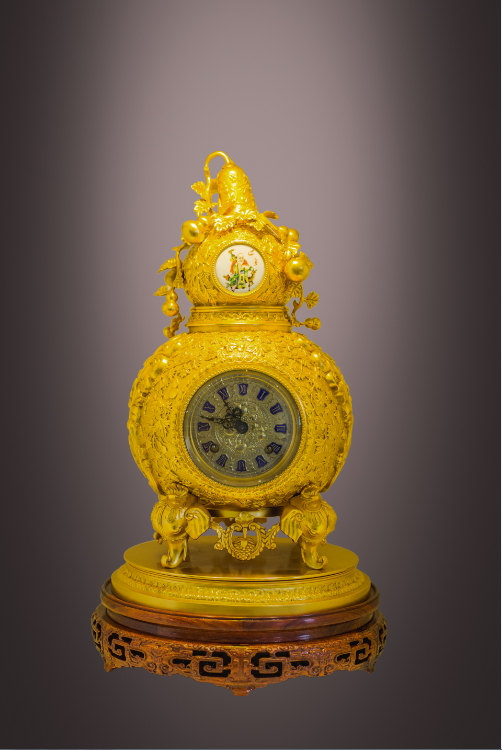 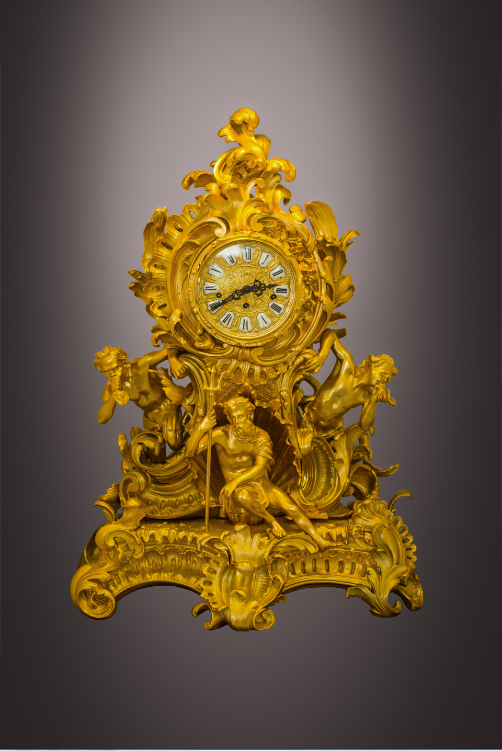 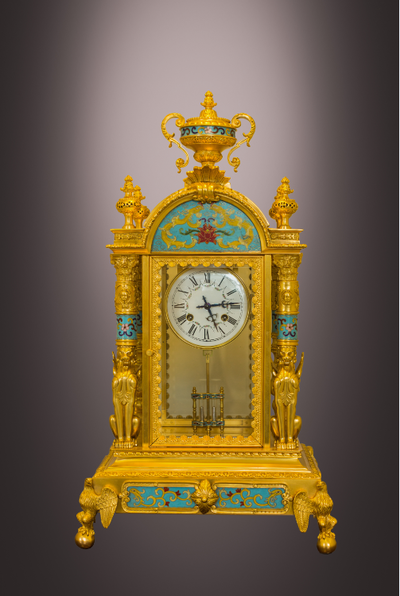 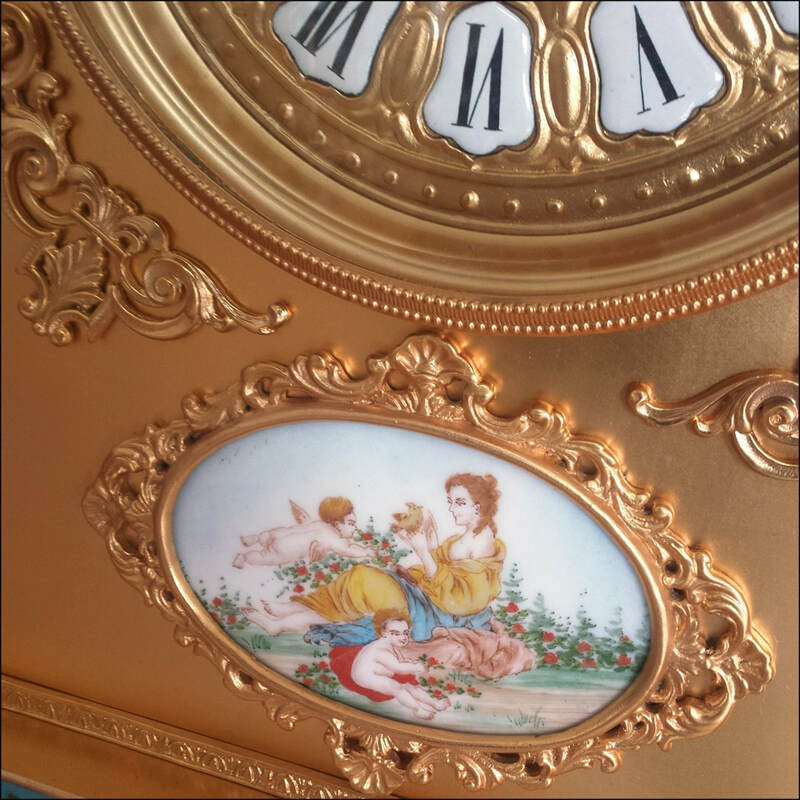 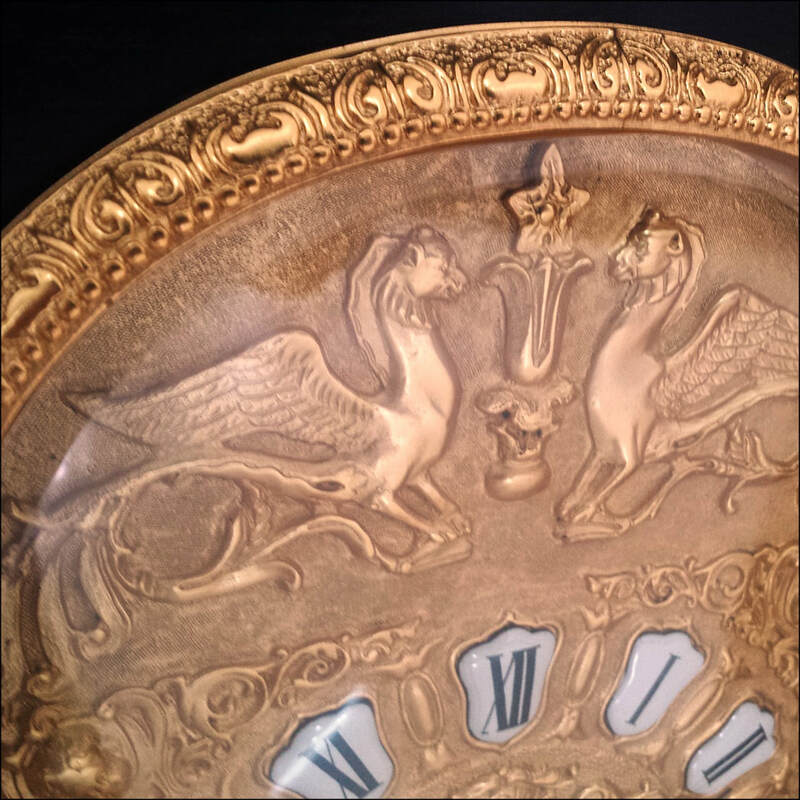 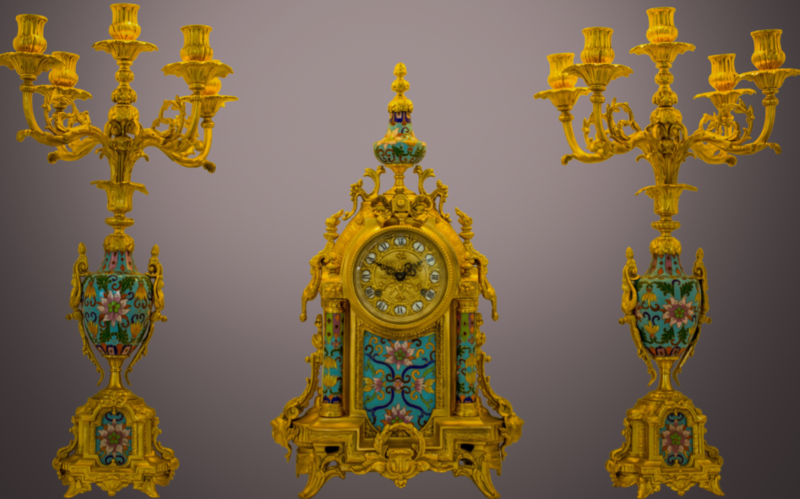 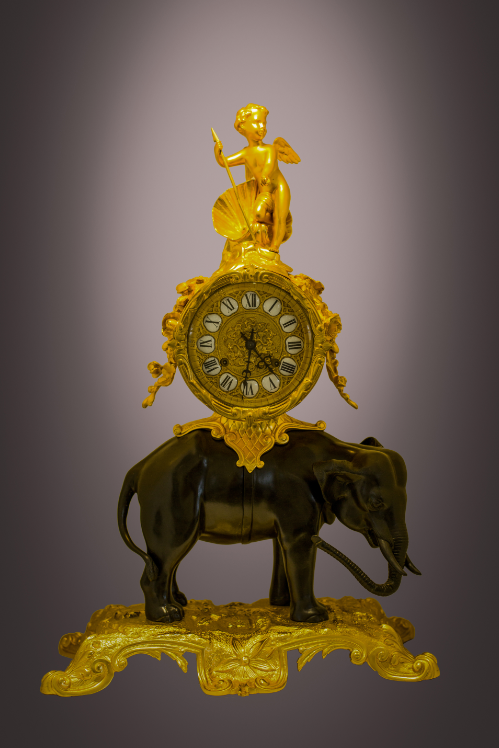 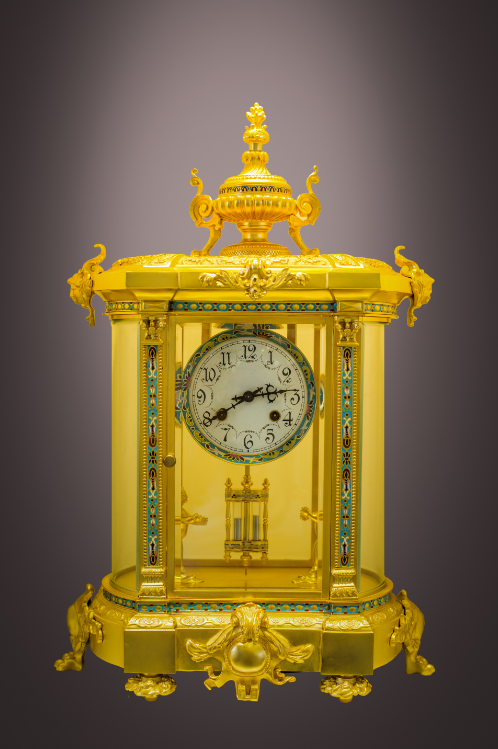 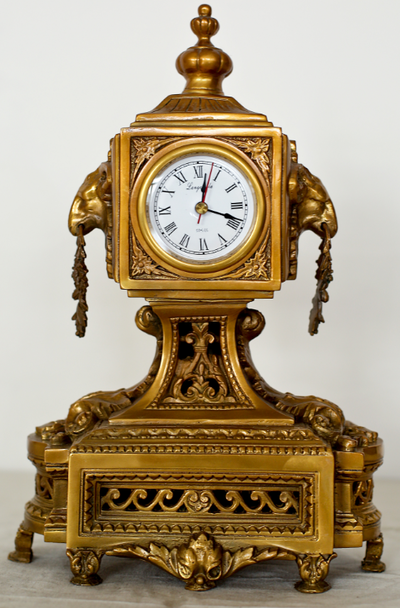 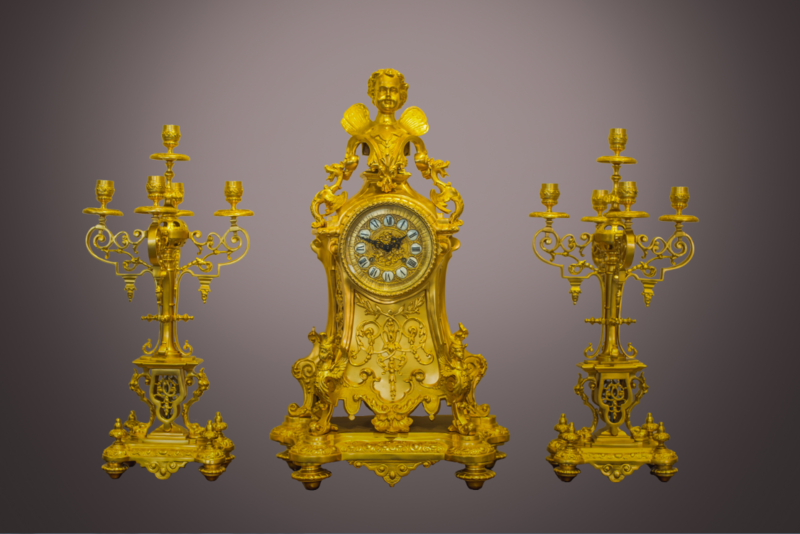 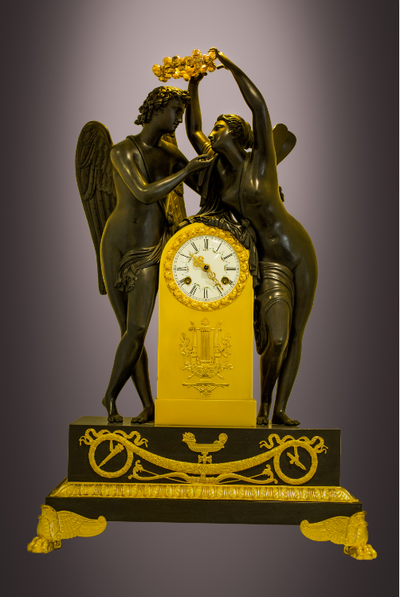 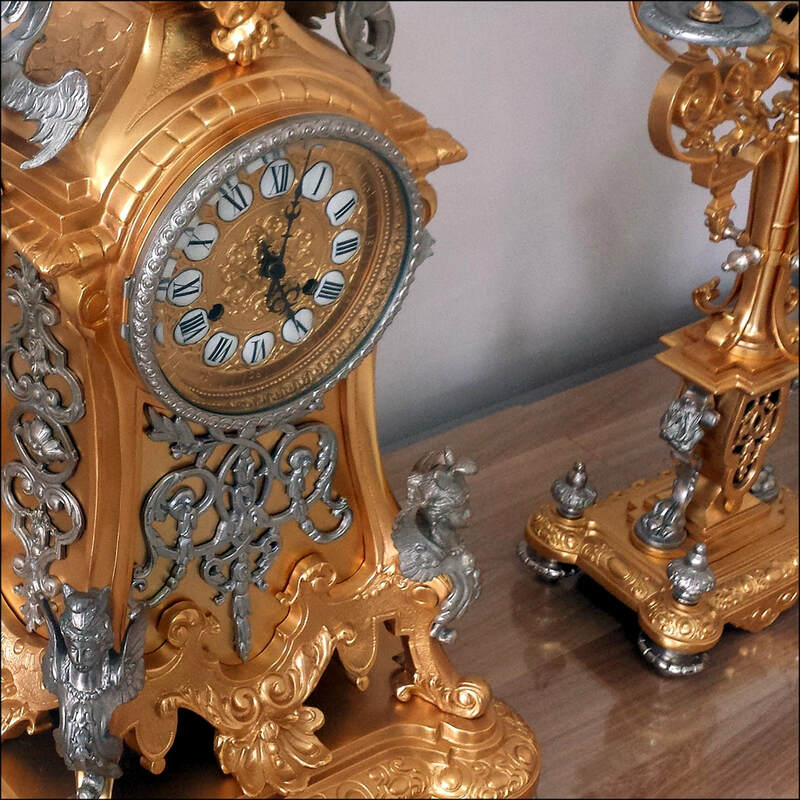 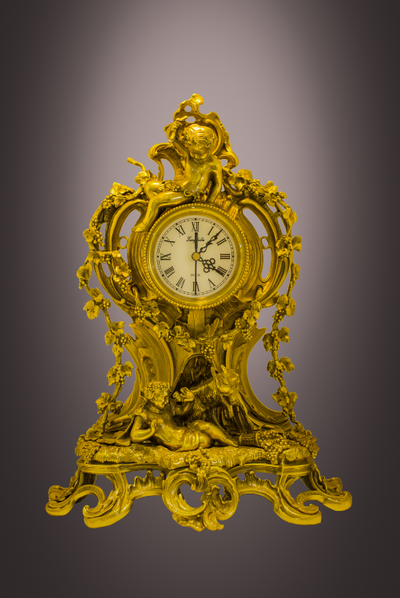 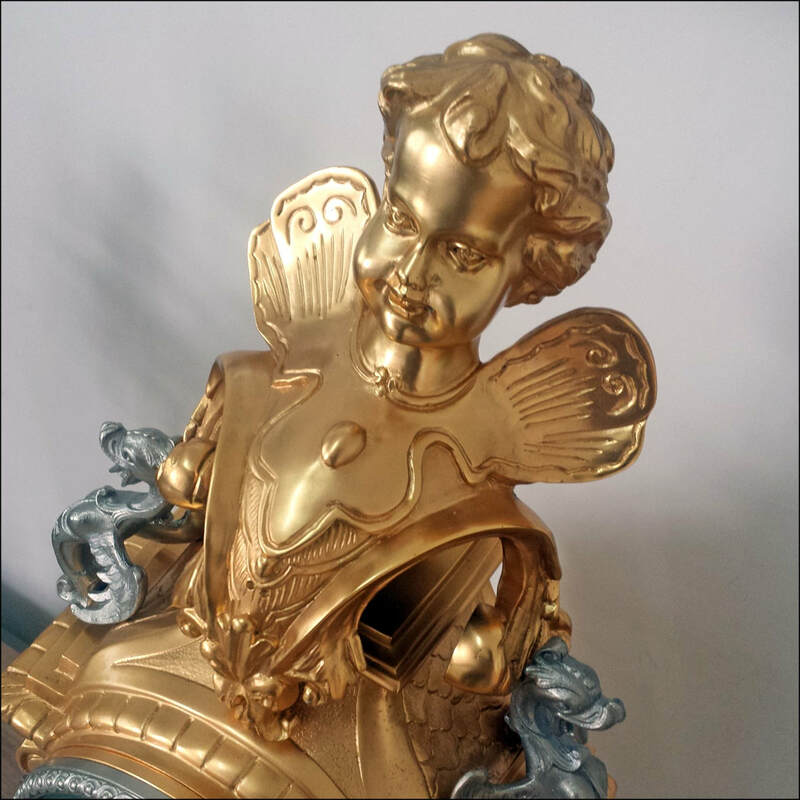 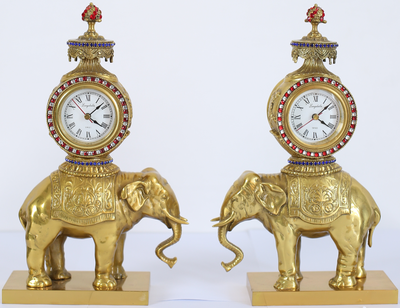 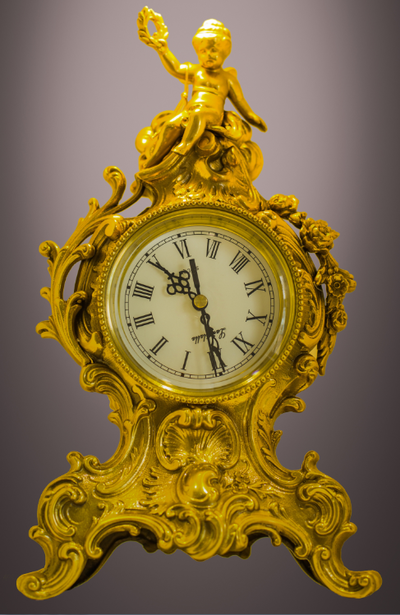 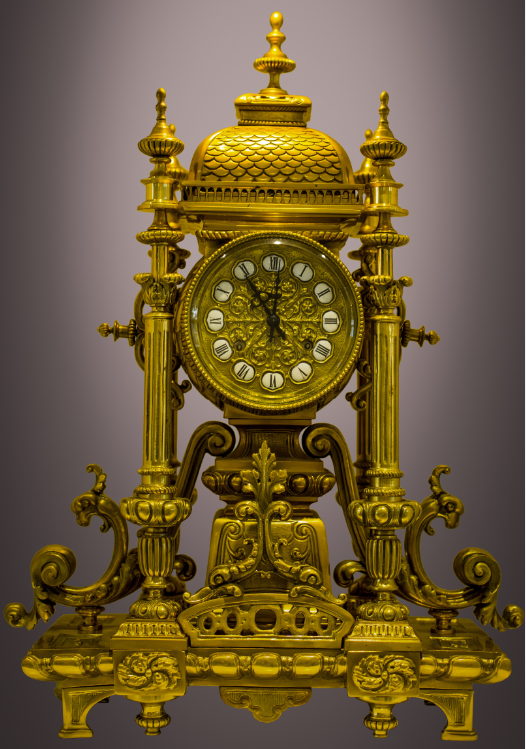 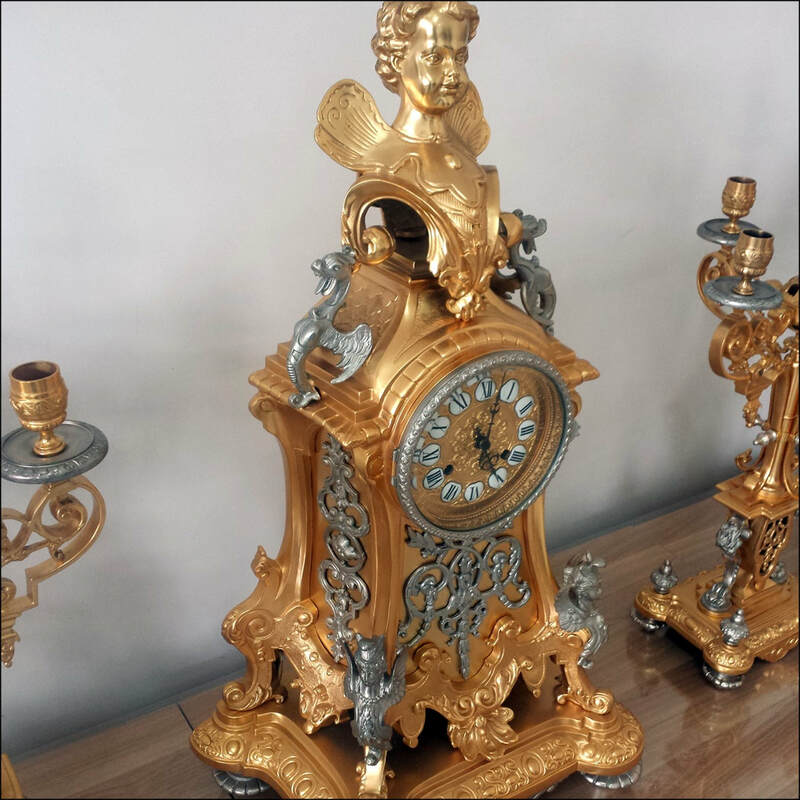 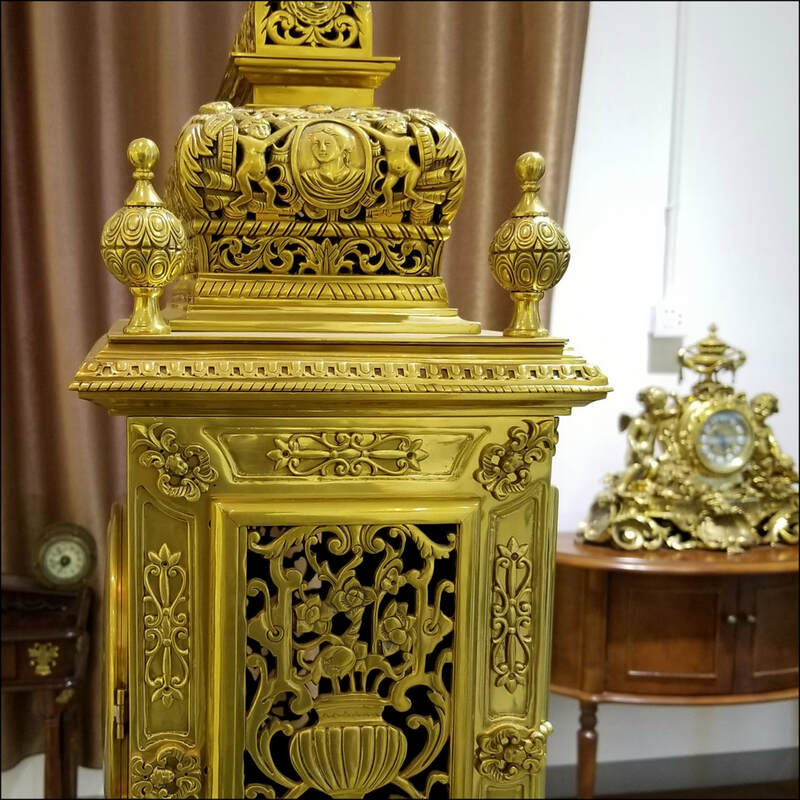 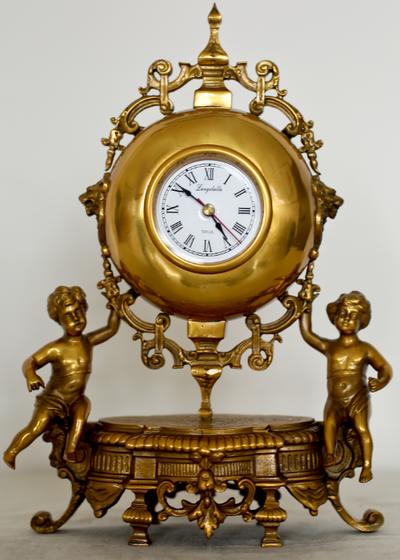 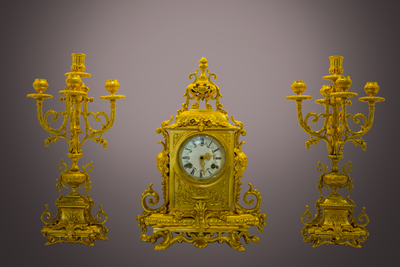 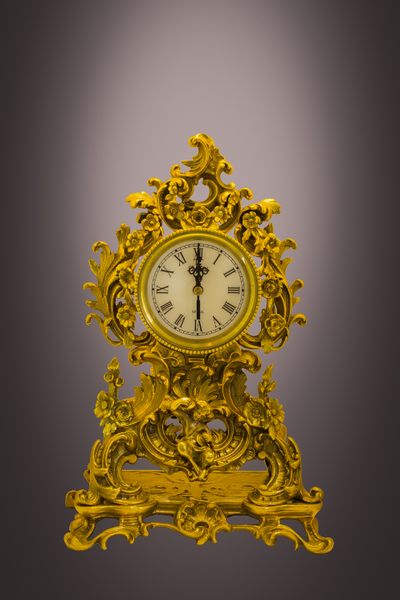 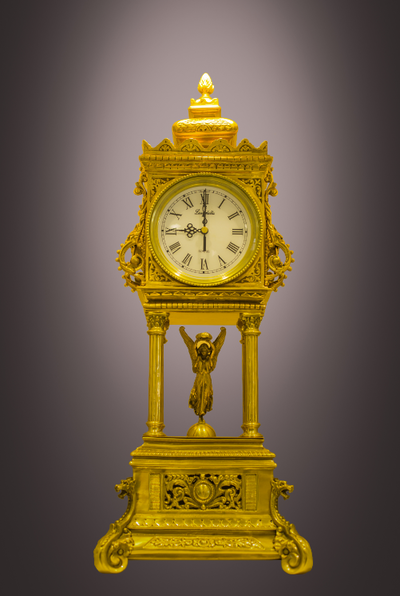 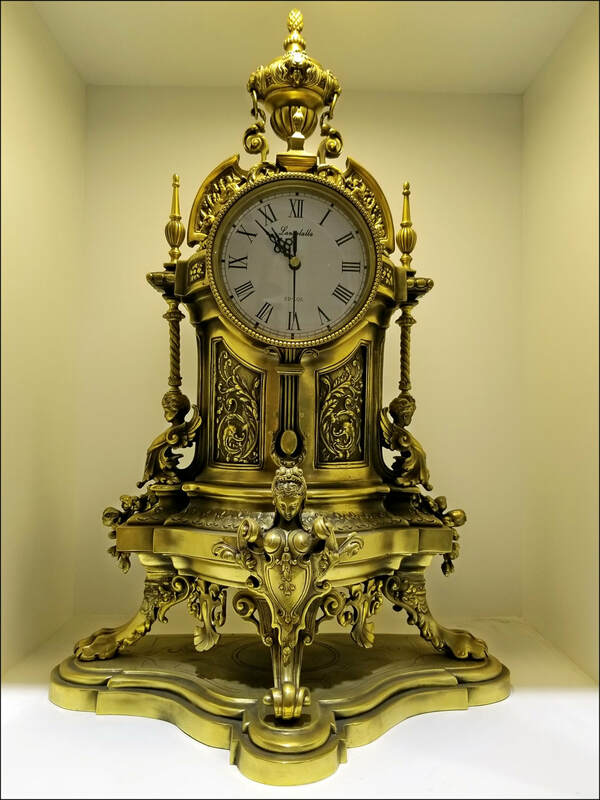 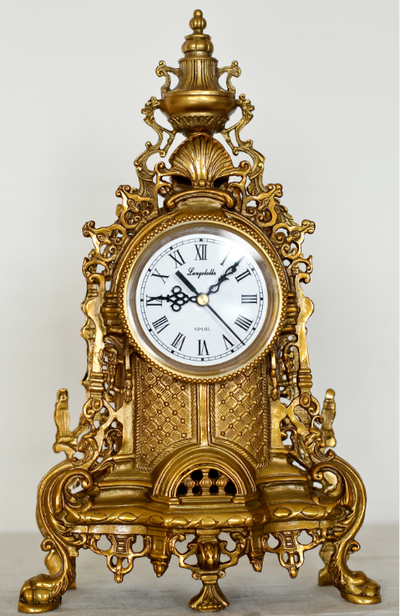 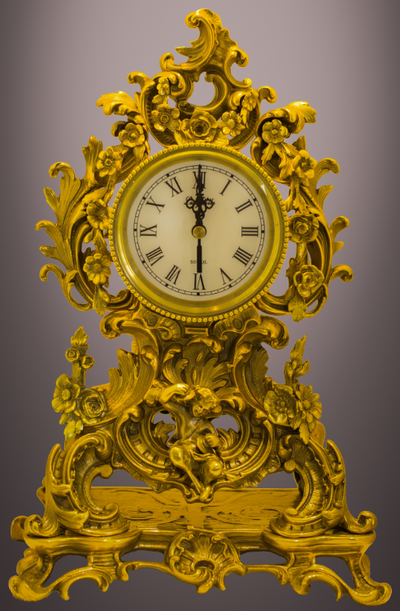 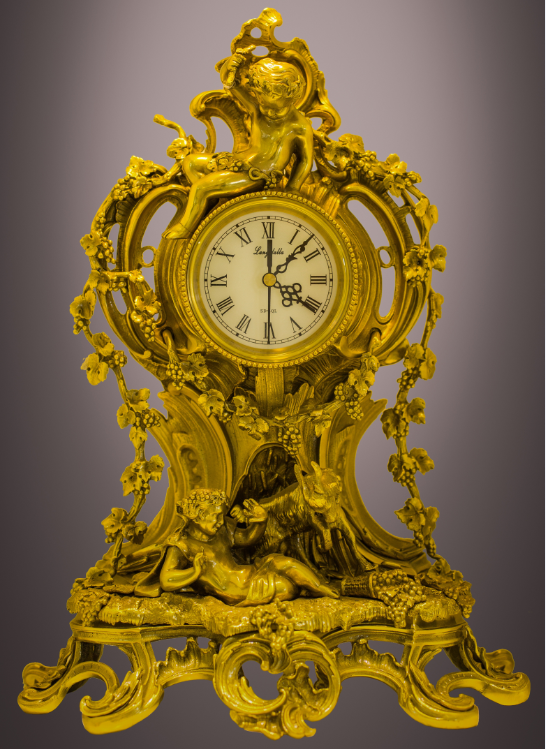 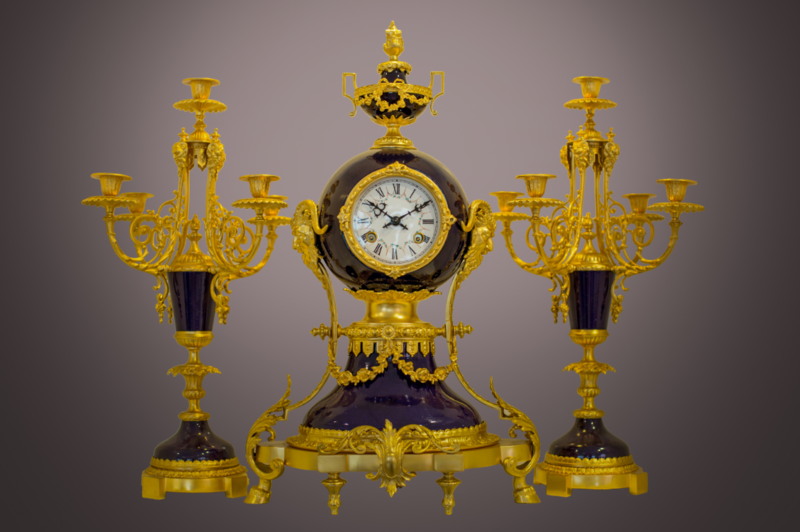 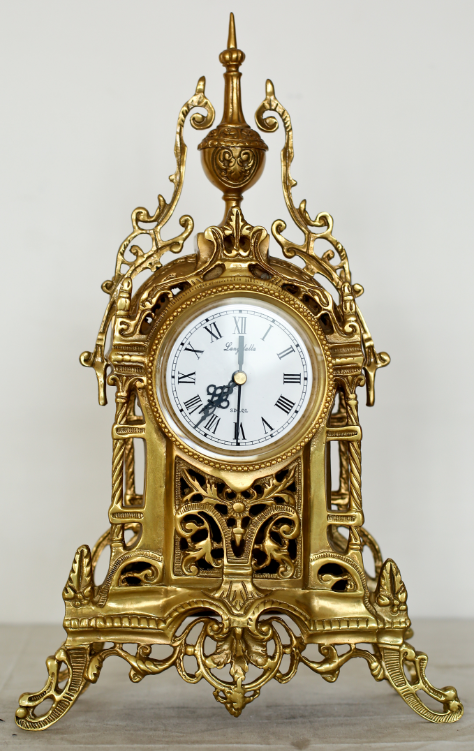 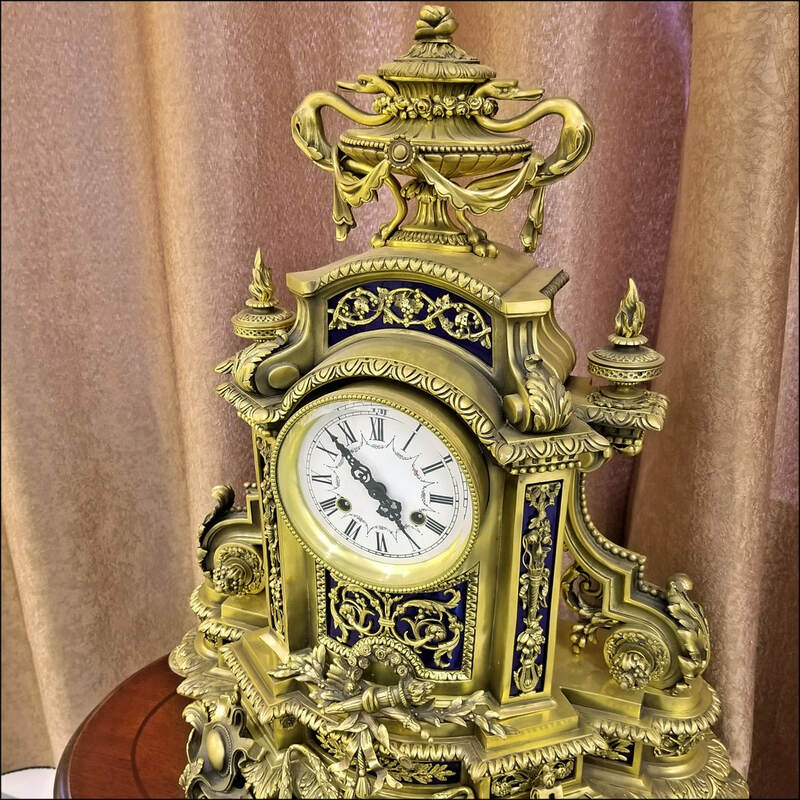 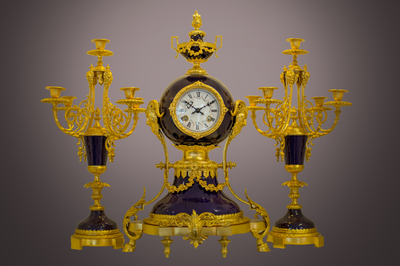 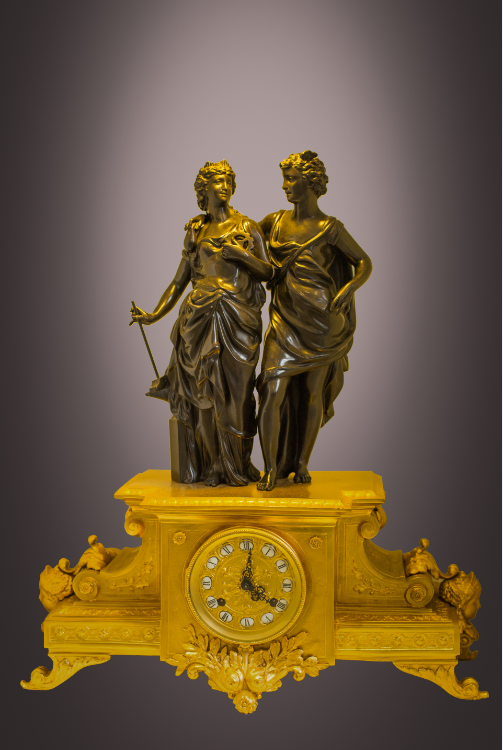 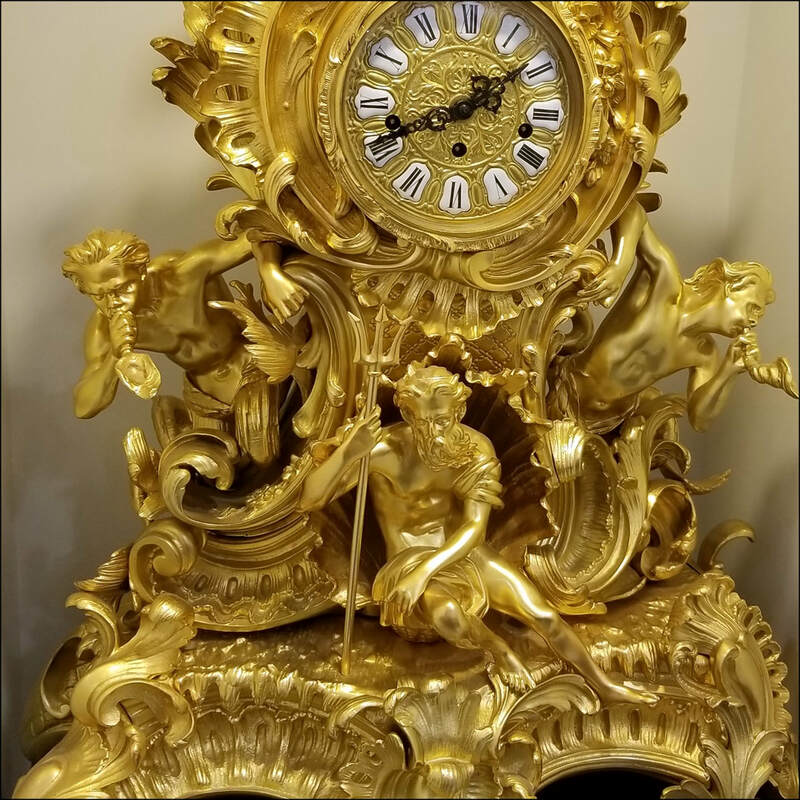 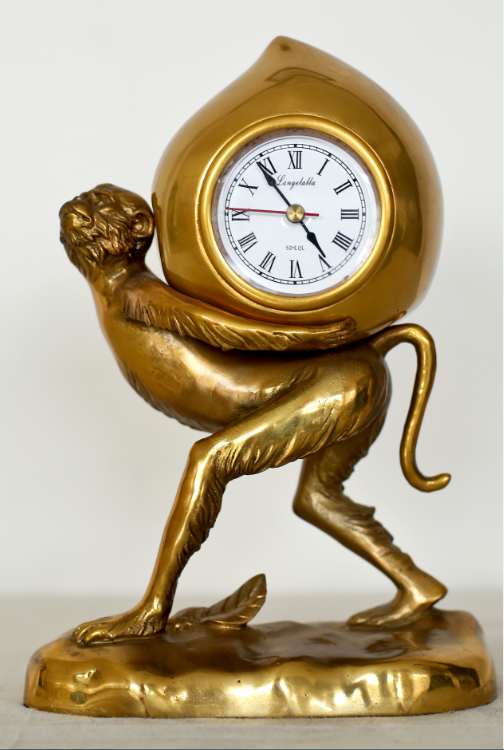 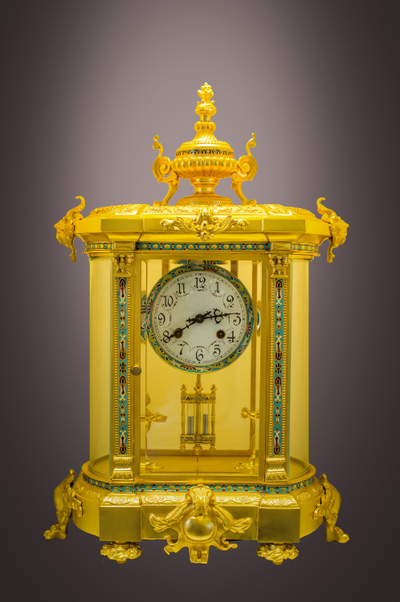 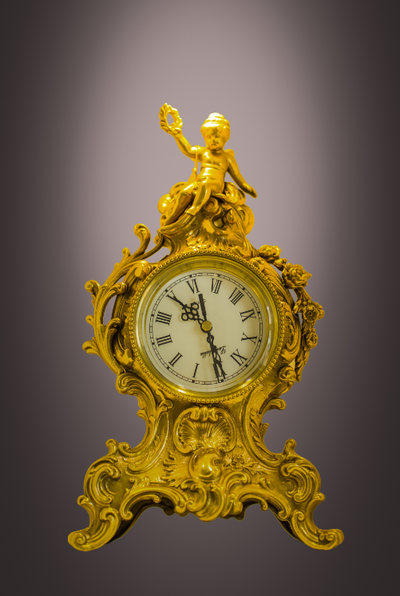 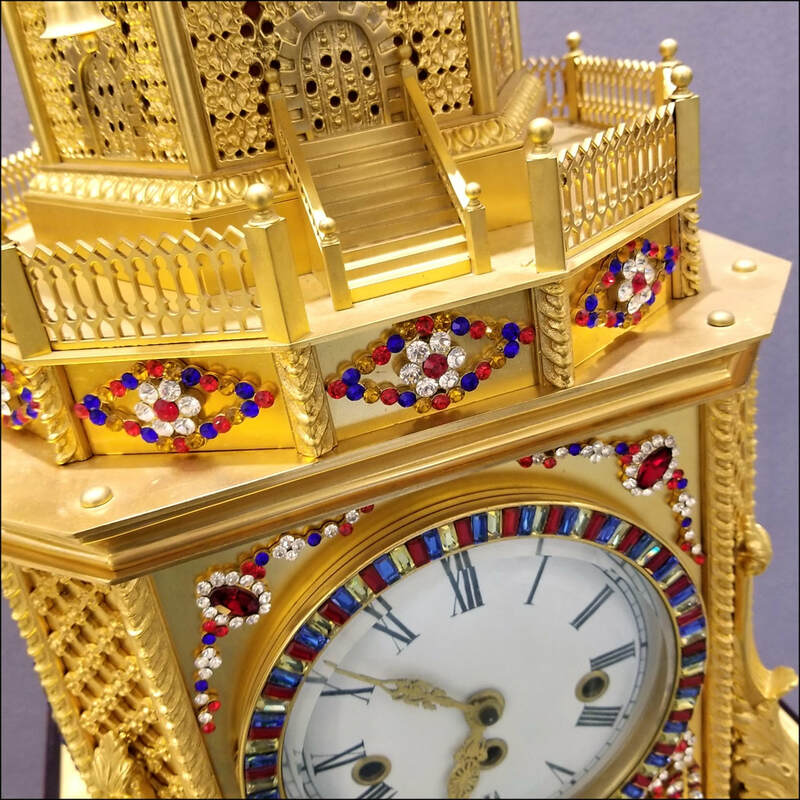 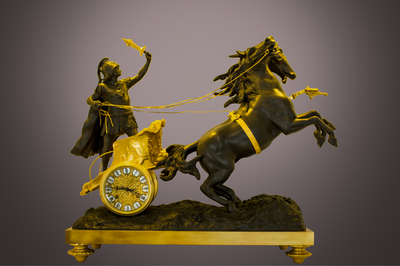 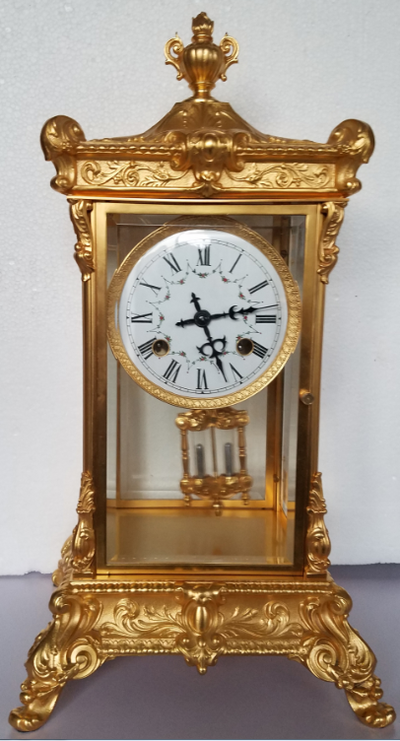 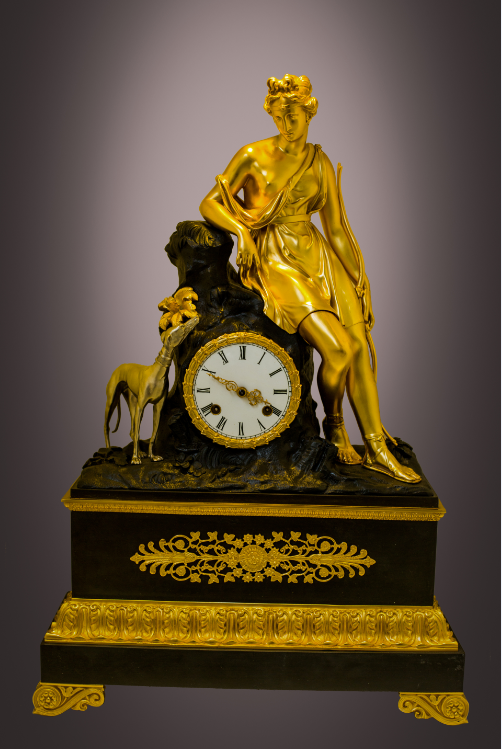 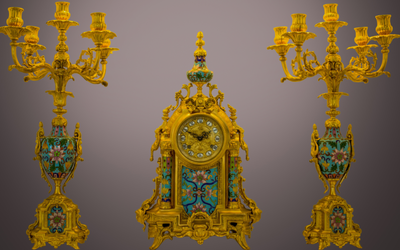 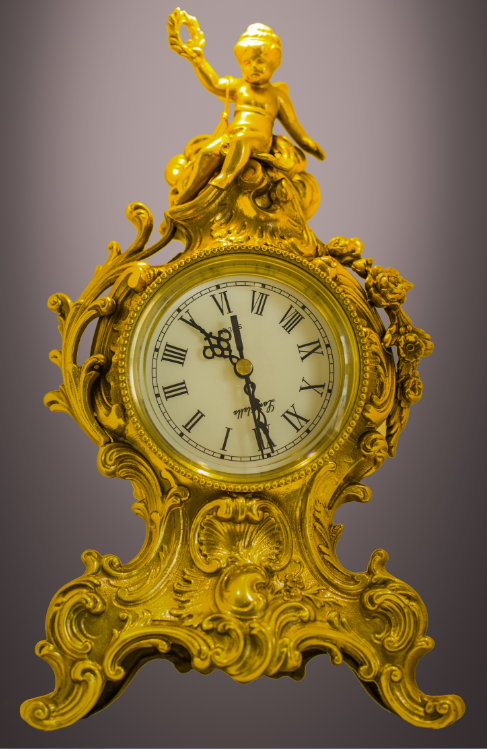 Although the movements and moving mechanisms are modern (Hermle, for many mechanical clocks, for example), the casting and finishing of these often very intricate clock housings are done old-school, with any modern twists mainly and only to make the processes more environmentally sound. 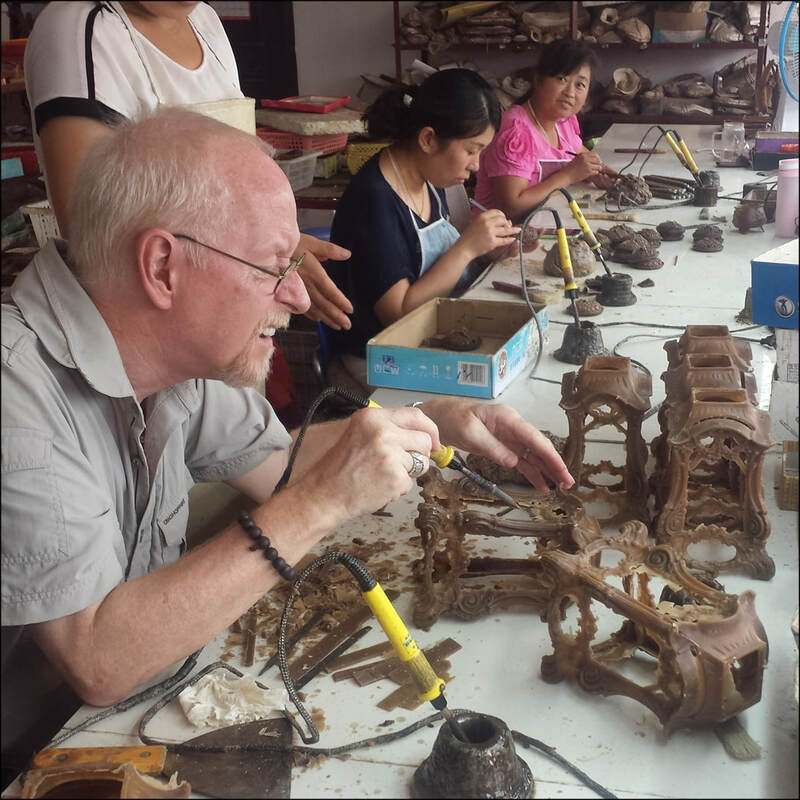 And Mr. Ma was pleased to show me that there'd been big improvements in that regard since my last visit in 2015, too. 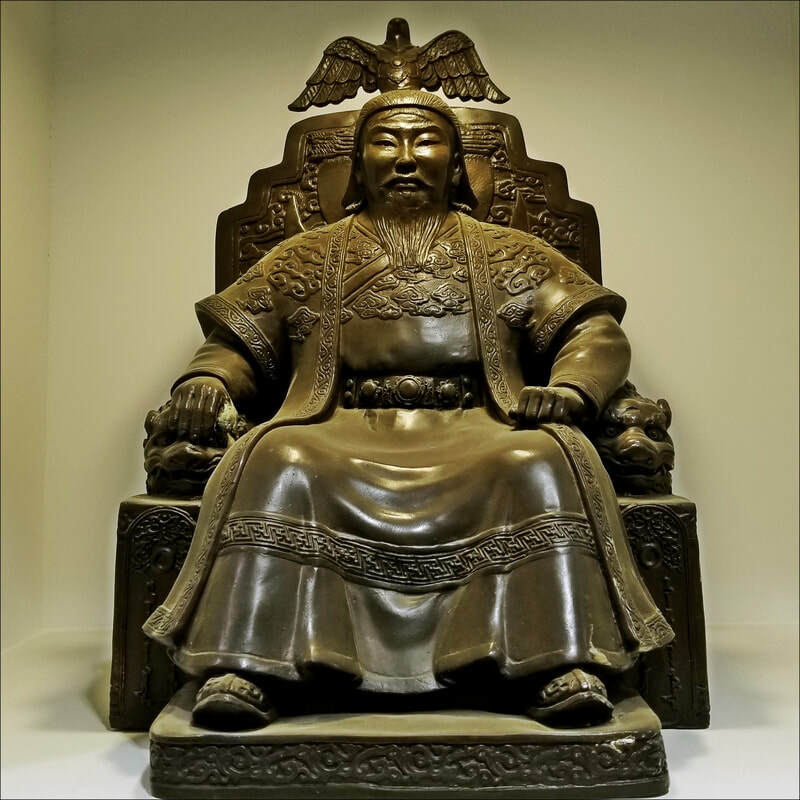 I'd made a discovery that makes internal flying in China much more comfortable than one might expect: CTrip/Trip.com often offers a little used but not expensive upgrade to many internal flights. 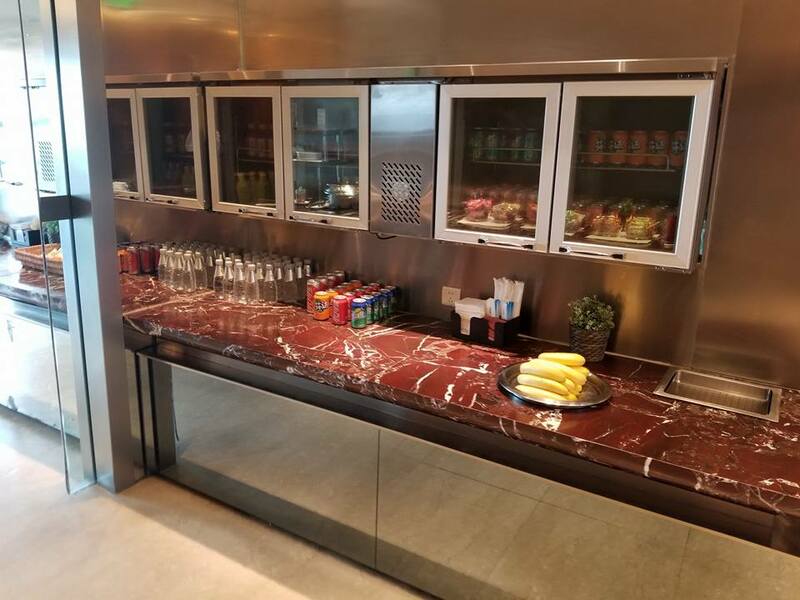 For a cost of about $20 at the time of booking, passengers can many times select to wait for flights in "VIP" lounges instead of at the usual, sometimes crowded, gates. 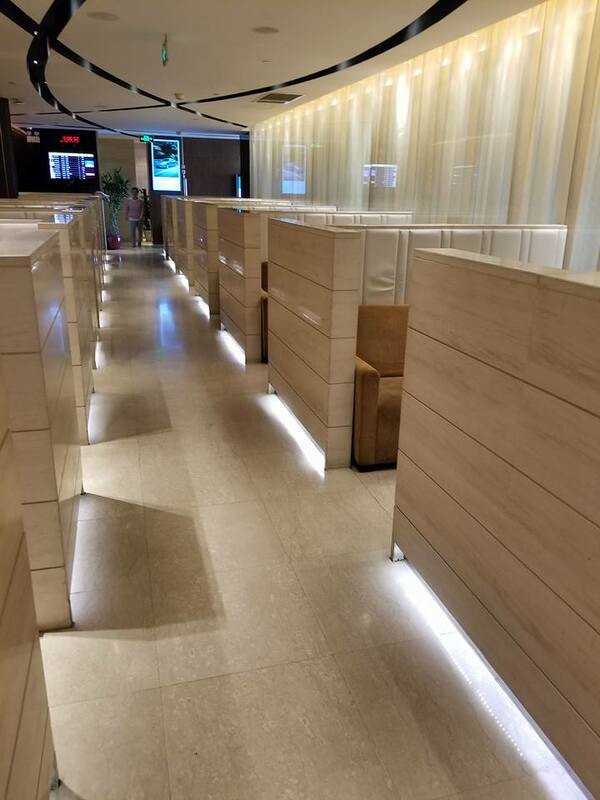 This upgrade is available even on the economy flights I always take, and covers free food and soft drinks/coffee/tea and so on, very comfortable chairs, USB power charging and a relaxed quiet atmosphere--well worth the small charge. 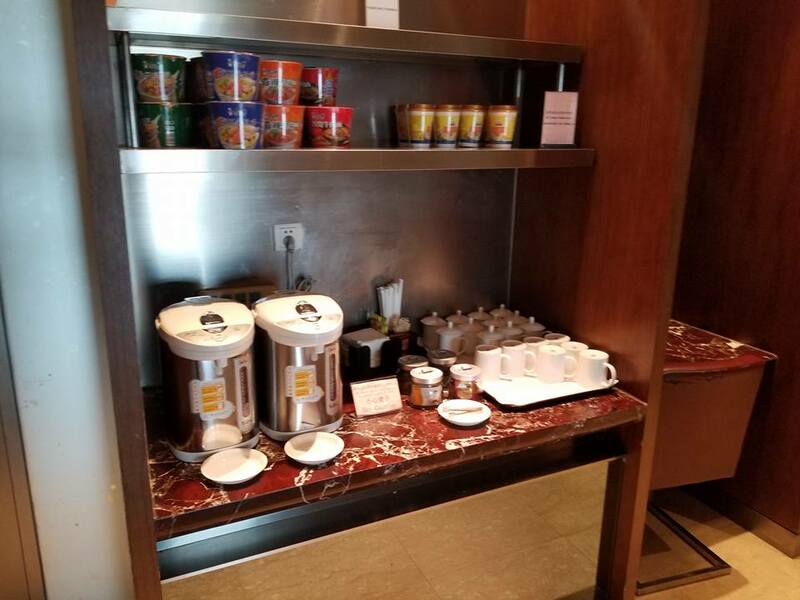 Shots from the #9 lounge at Shanghai Pudong/PVG. 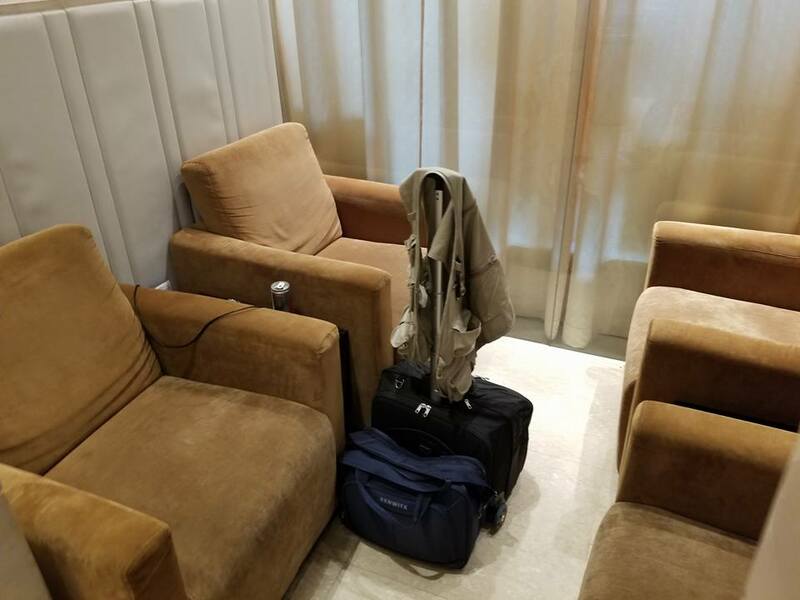 So, it was a comfortable wait, with the flight leaving Shanghai at 10:20AM, and arriving at 12:15PM in Jinan, Shandong. 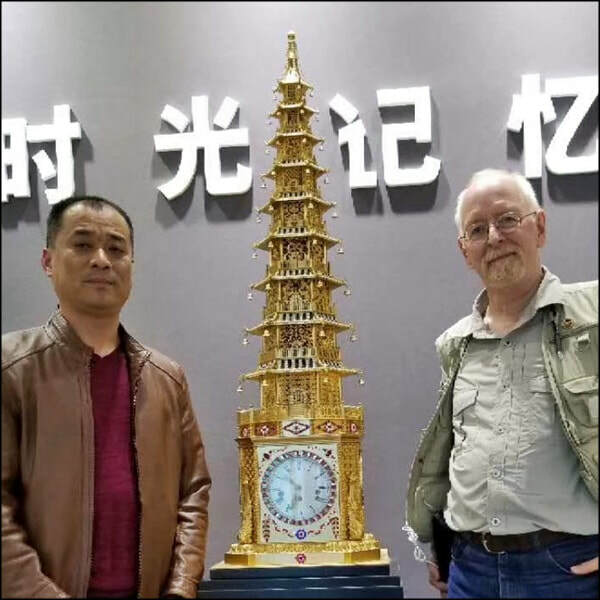 Landing was followed by a two hour drive from Jinan to Liaocheng. 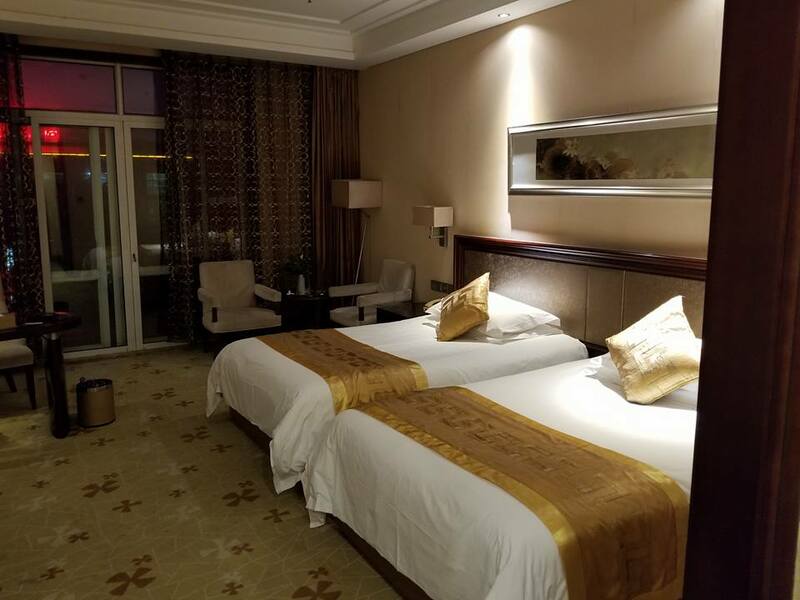 Mr. Ma had very kindly arranged for a DiDi driver for me from Jinan to Liaocheng, and had booked me accommodation at Liaocheng's 5-star Arcadia International Hot Springs Hotel. 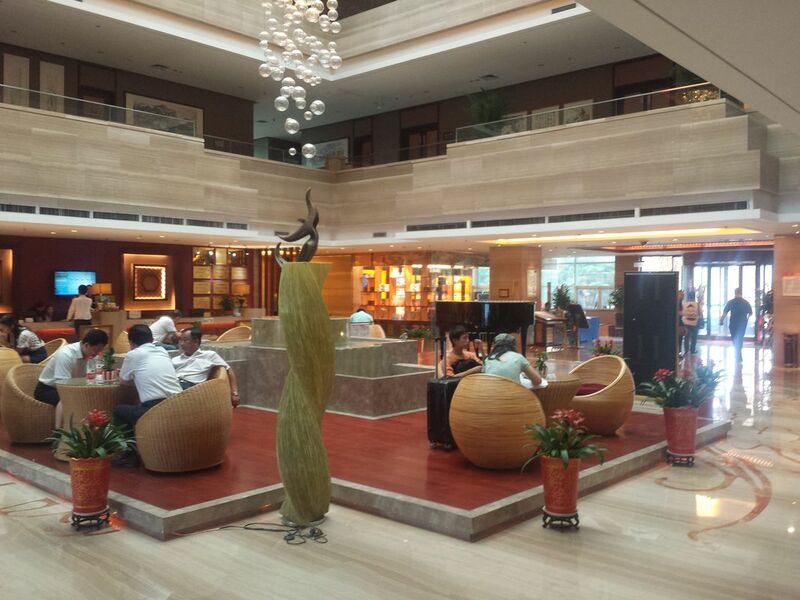 Look the hotel up, because my photos really don't do the place justice. 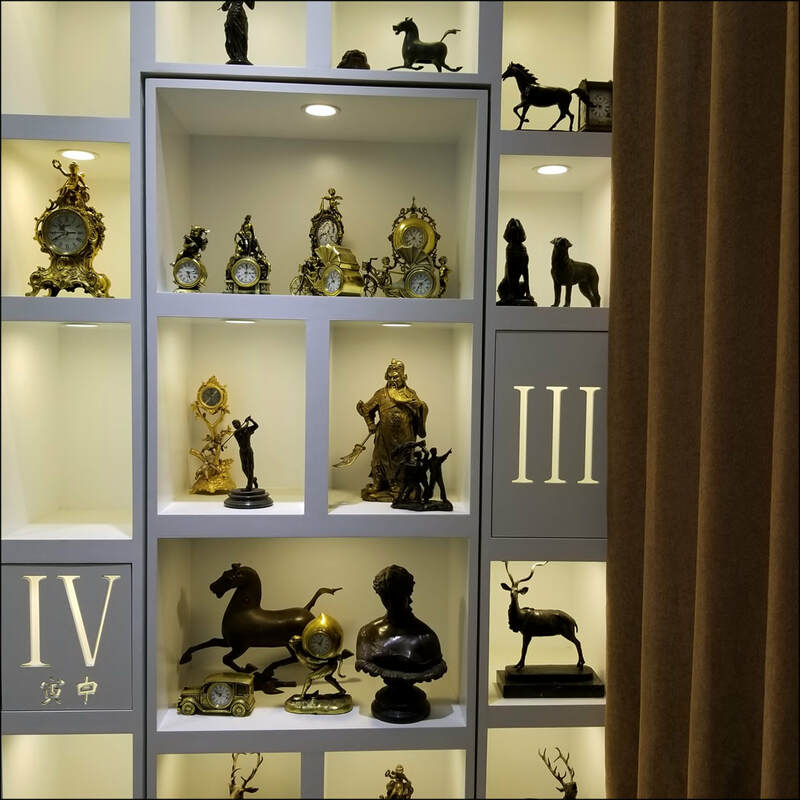 It's a first-rate place, and I'm more than grateful for the hospitality. 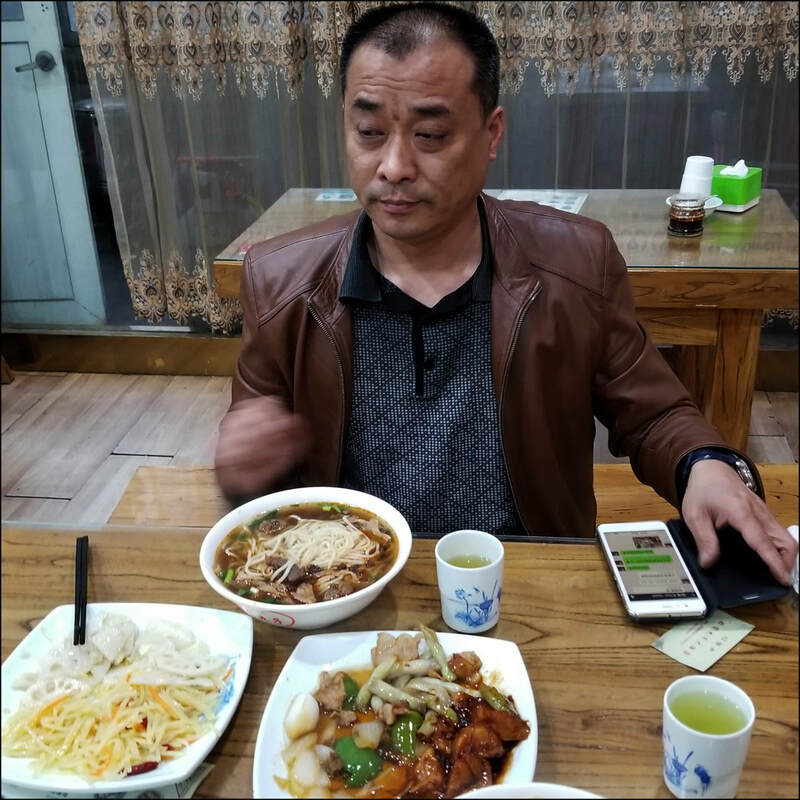 Mr. Ma met me at the hotel soon after arrival and asked where I wished to eat. 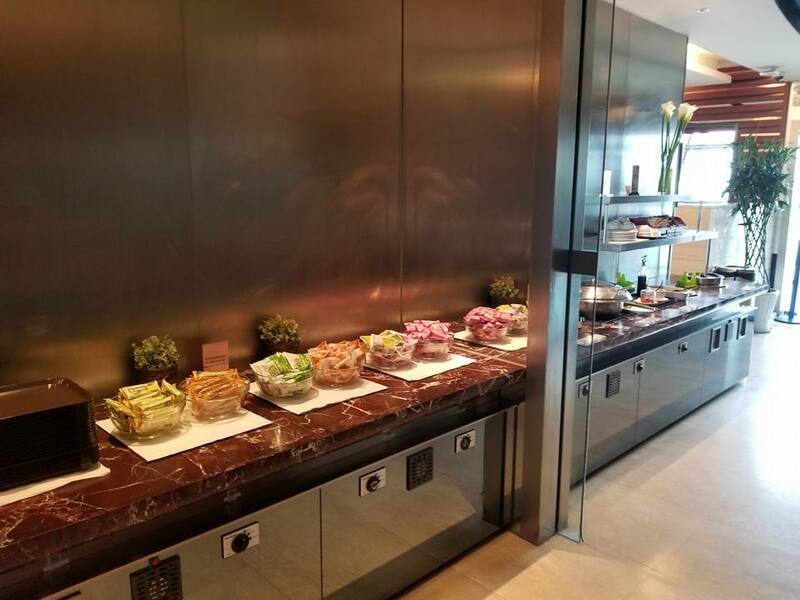 The Arcadia has its own very high-end on site restaurant, and I'd eaten there happily on my last visit, but I wanted something not so rich, and more "normal Chinese eating". 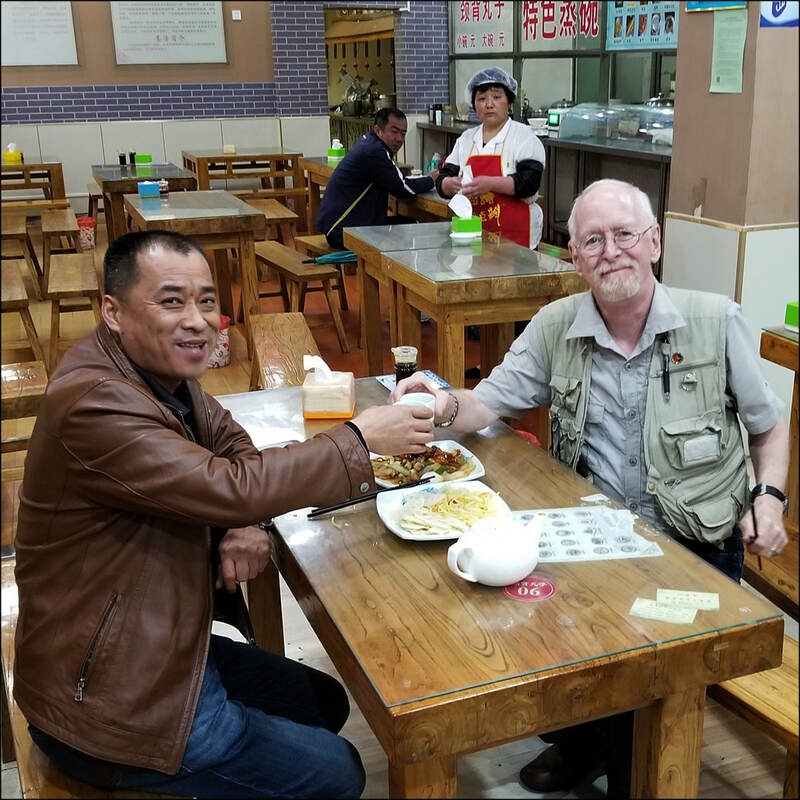 Mr. Ma is as personally considerate as anyone I've ever met, and he made me feel like a friend immediately, so I asked instead if we could visit any regular neighbourhood eatery that he liked. 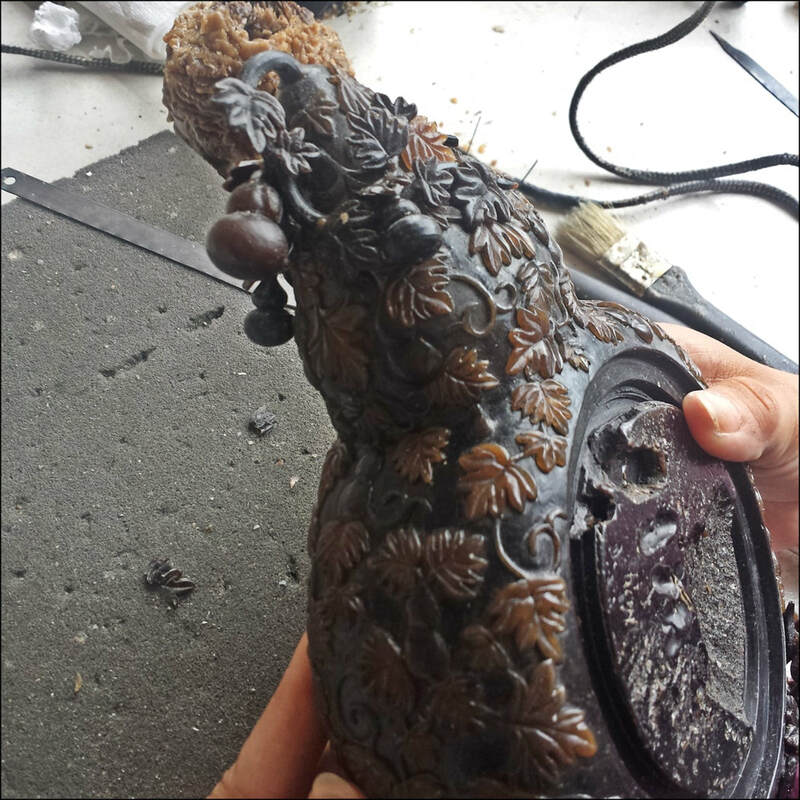 That worked out beautifully. 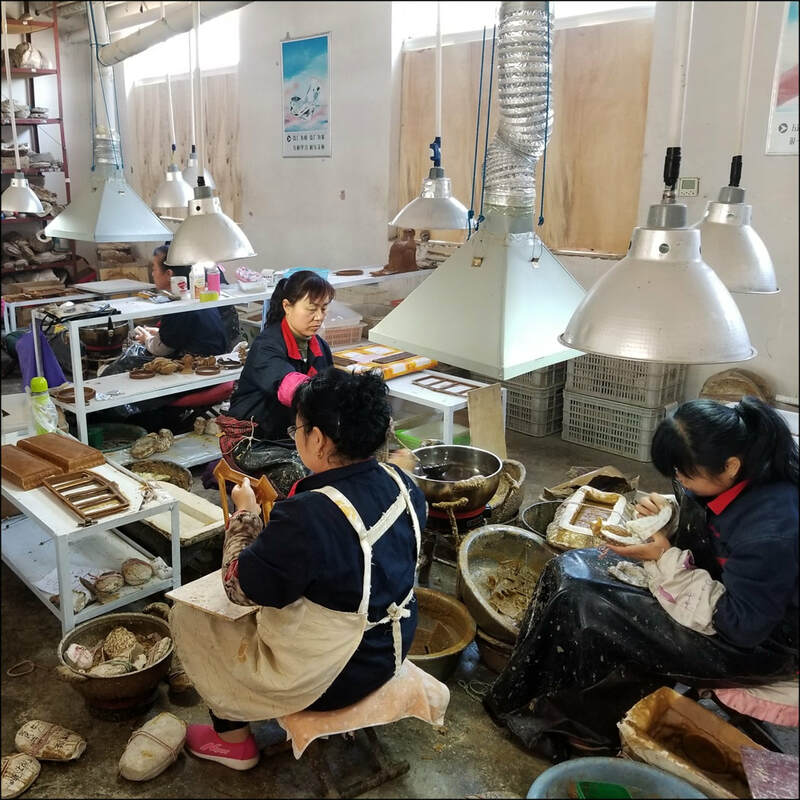 Very shortly, we were at a local place, catching up mutual news, and stuffing our faces with green tea and down-to-earth and tasty Shandong culinary and social goodness. 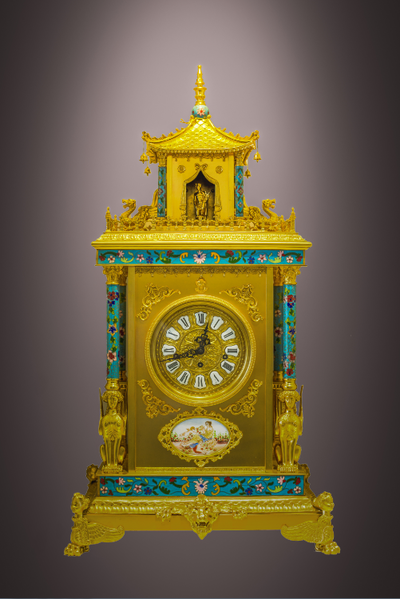 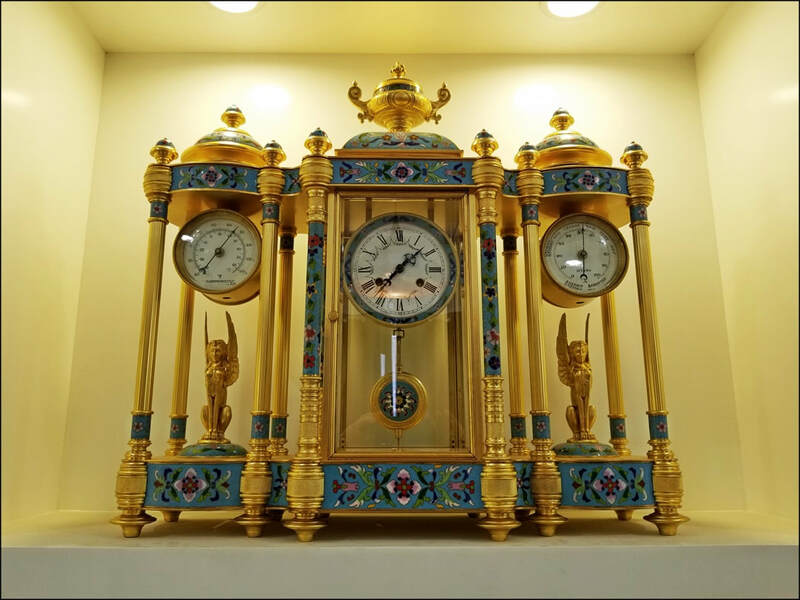 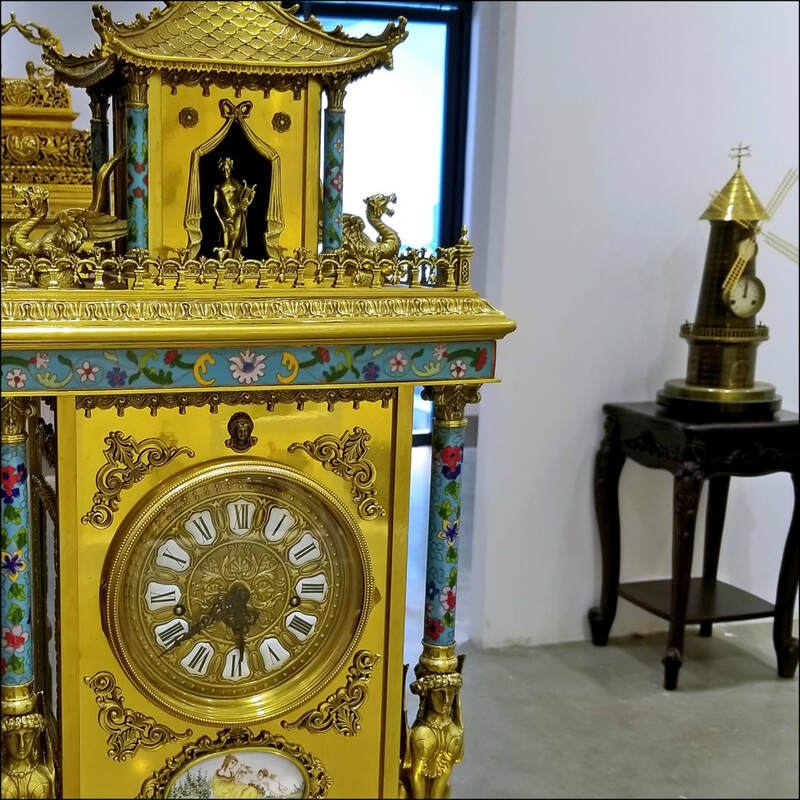 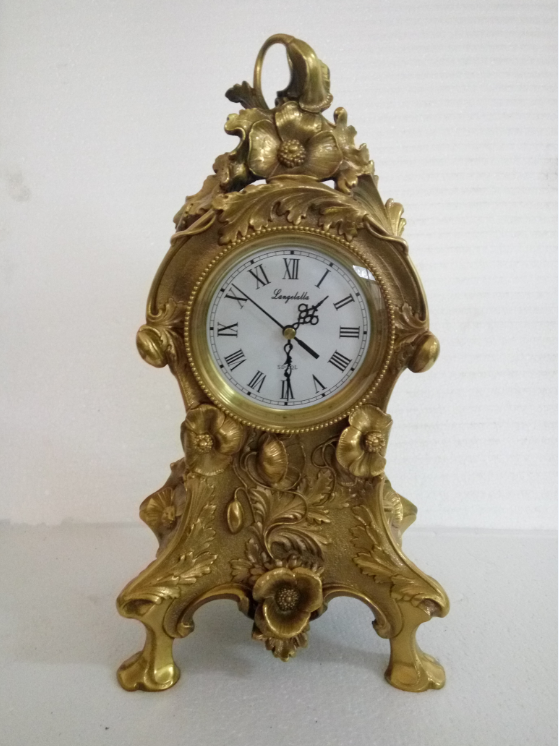 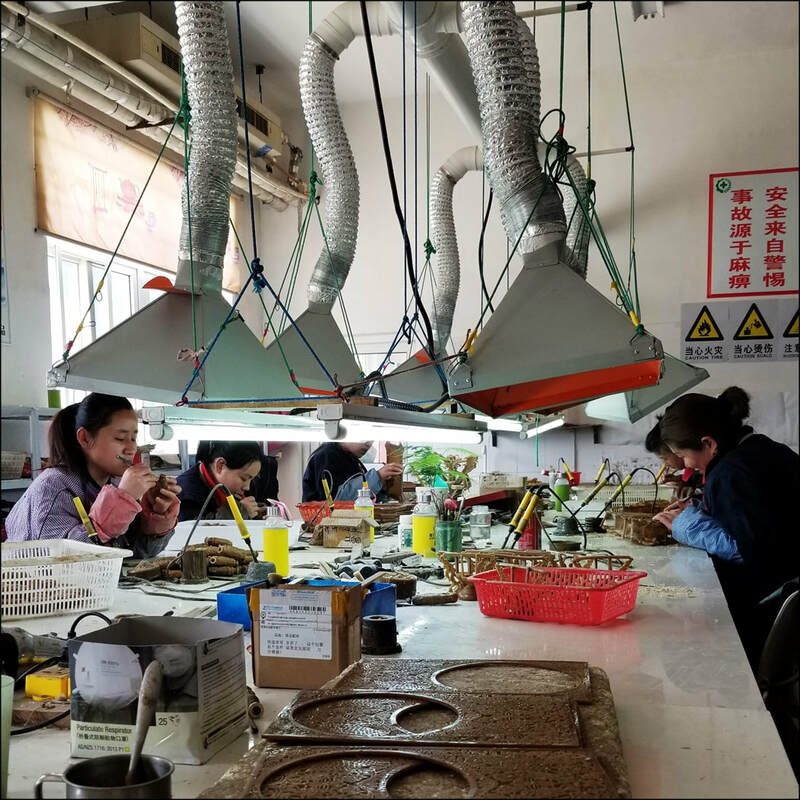 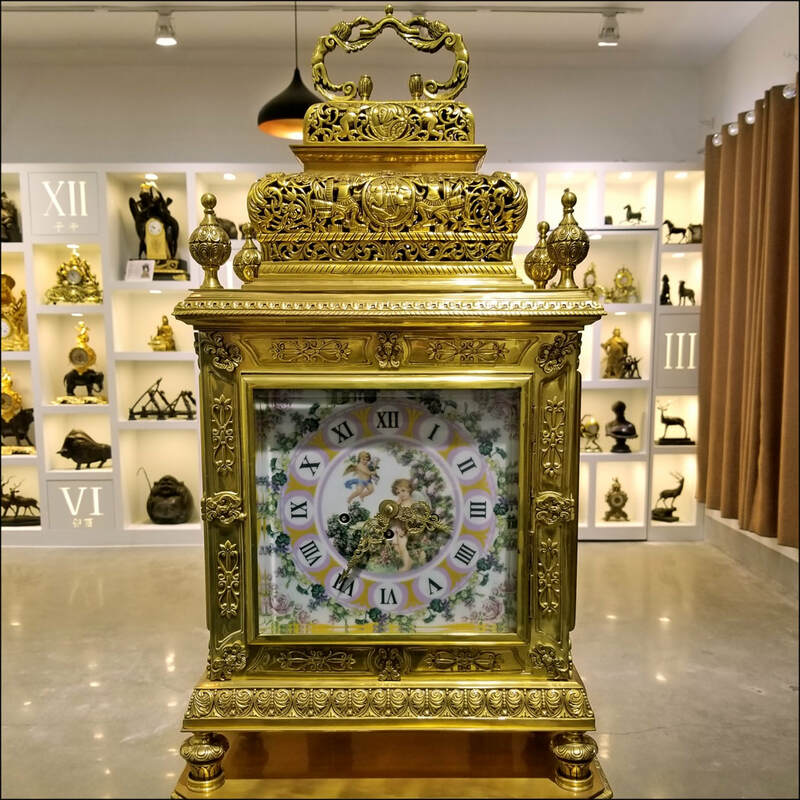 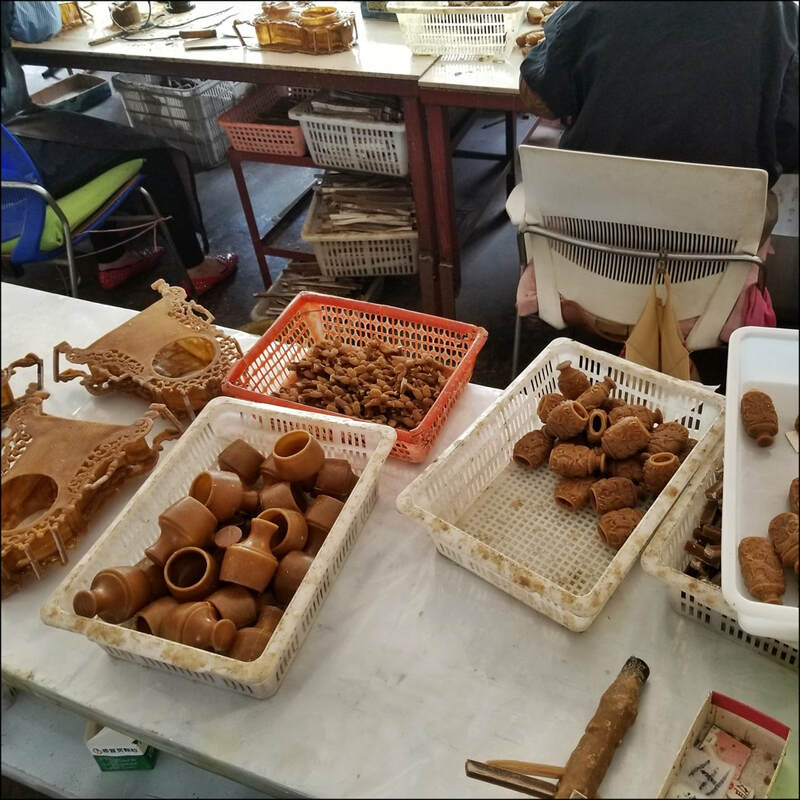 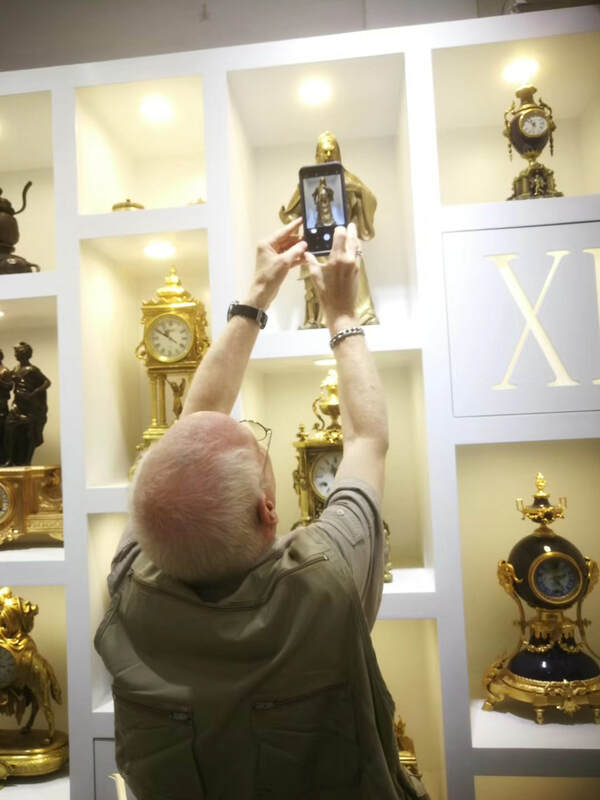 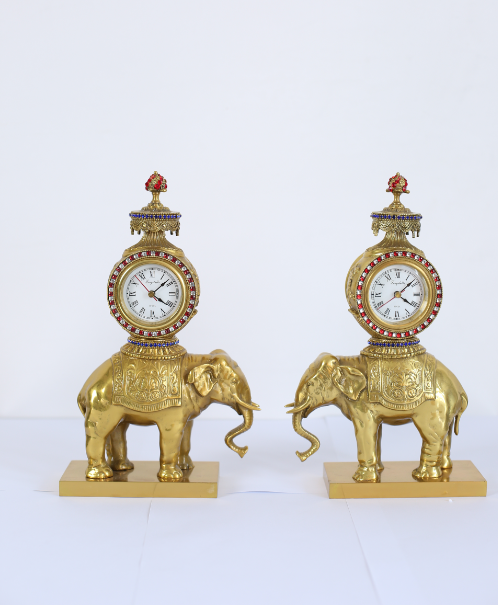 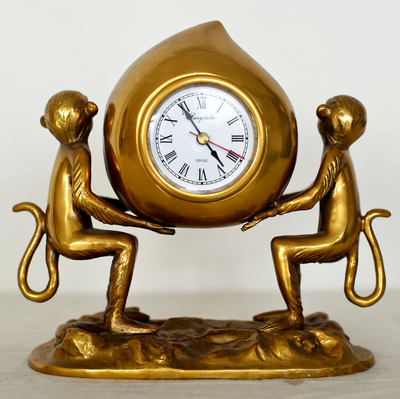 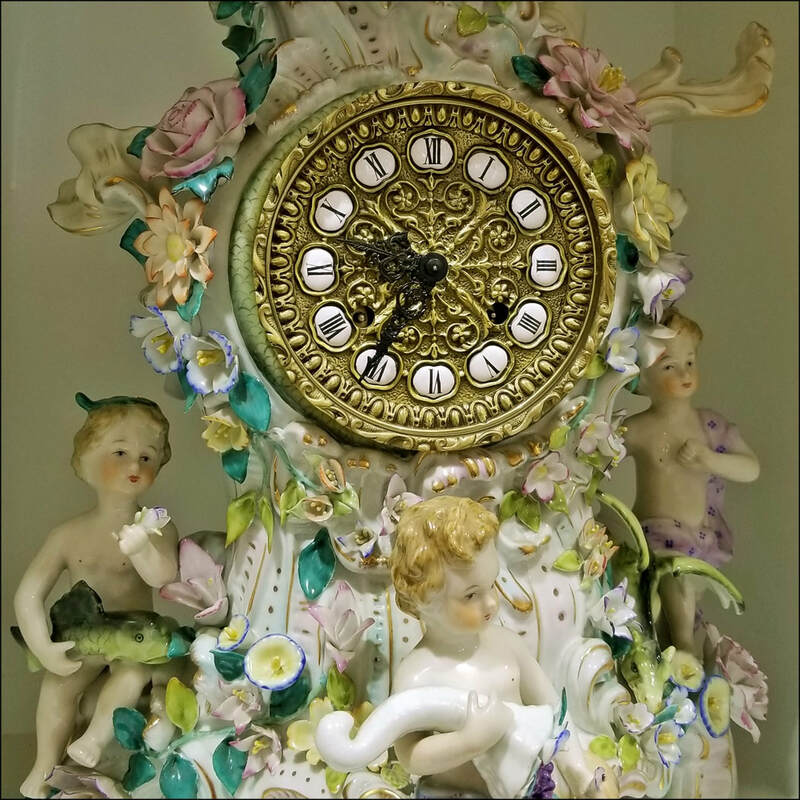 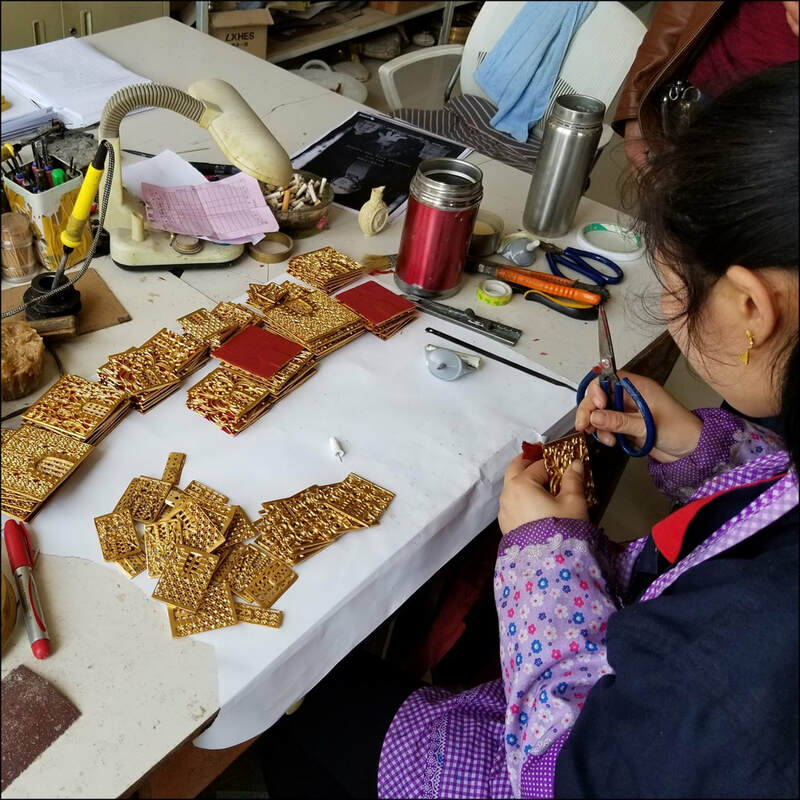 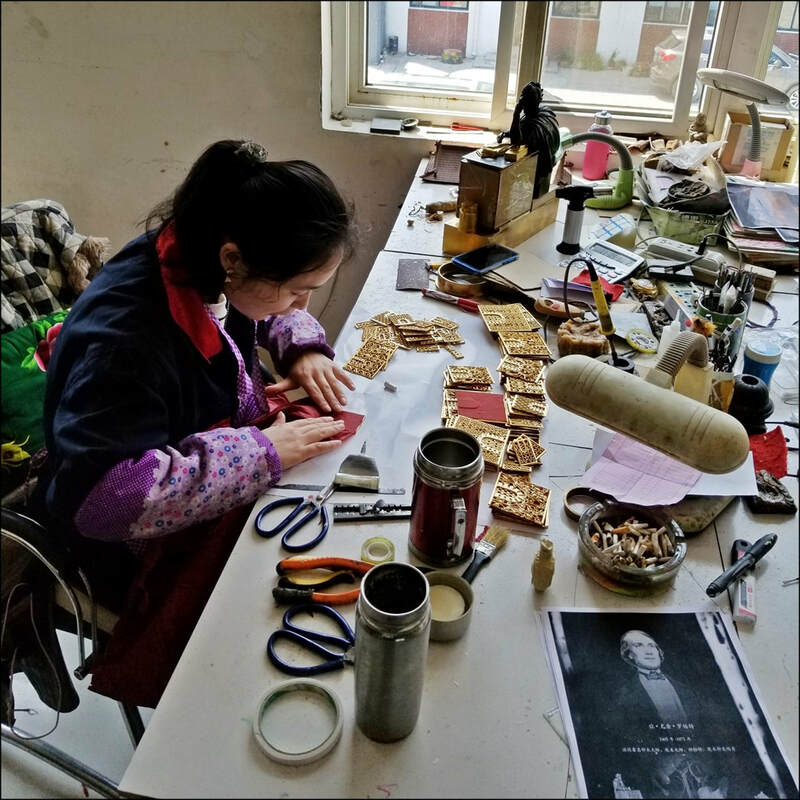 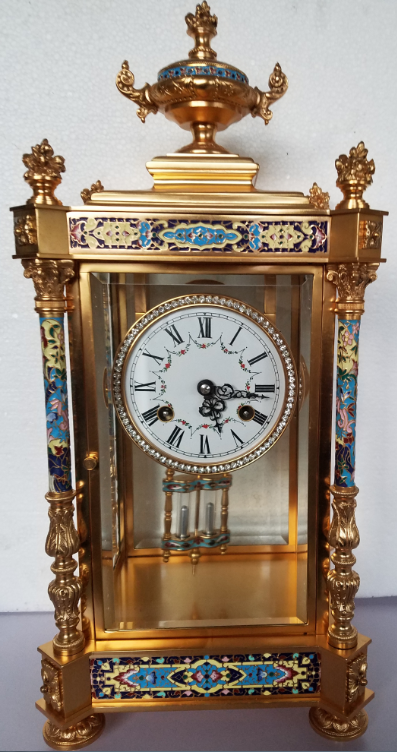 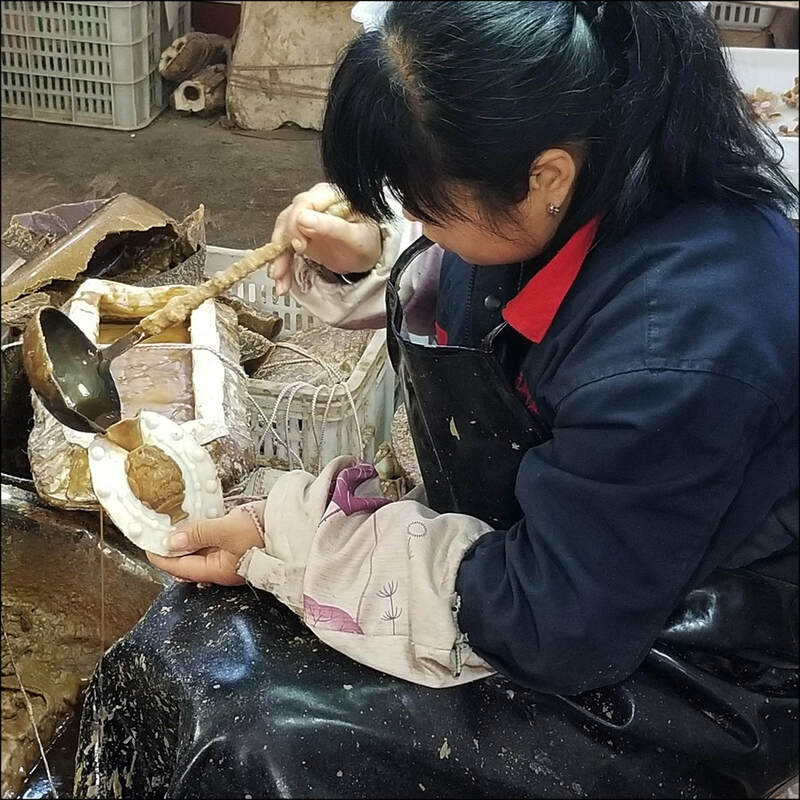 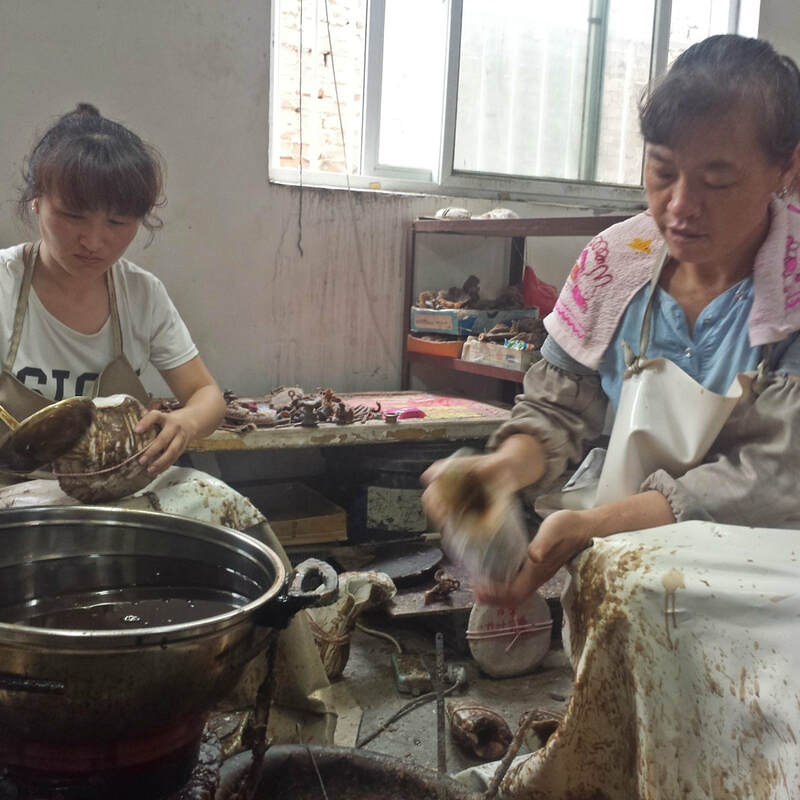 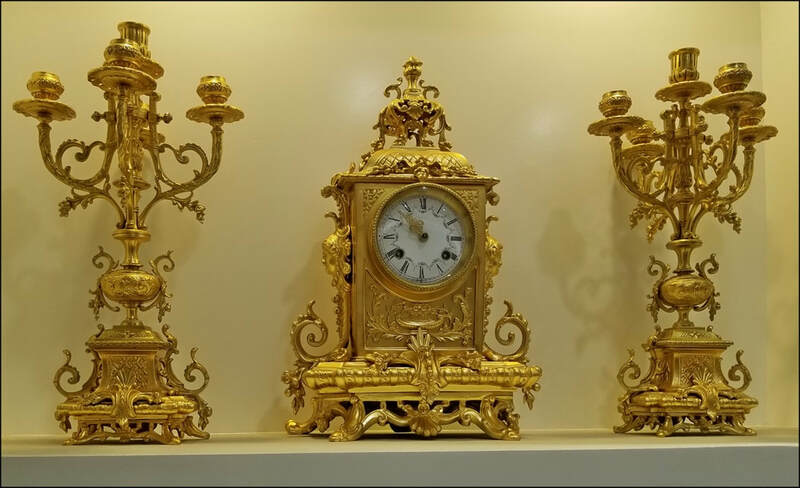 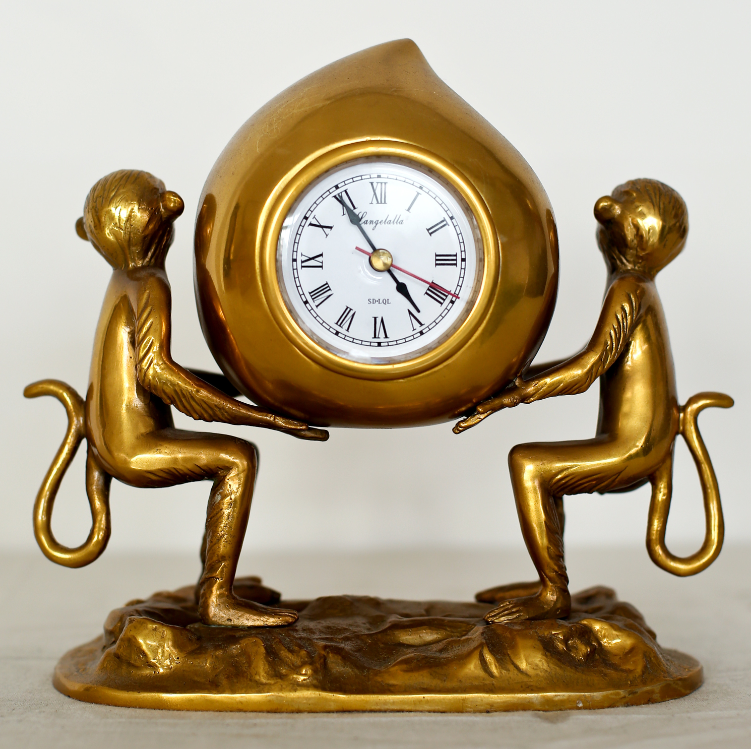 The next two days were filled with exploring Liaocheng as well as visits to two factories: Shandong Liaocheng Zhong Tai Watch Company (Taishan) and, the subject of this post, so: back to clocks...Shandong Langelo Arts & Crafts. 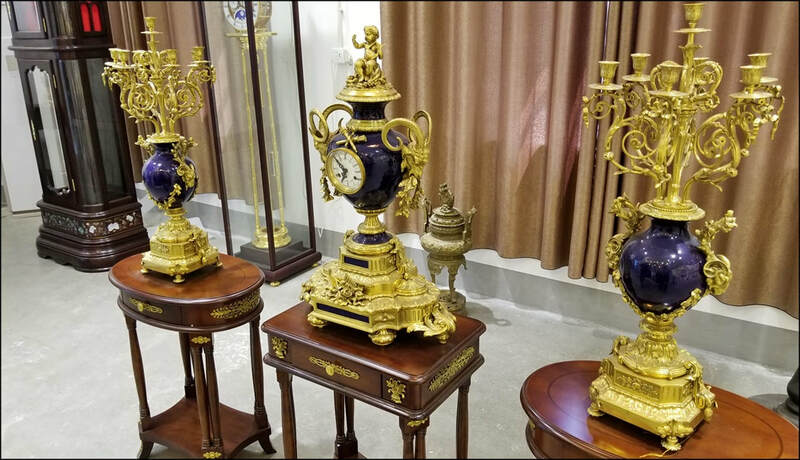 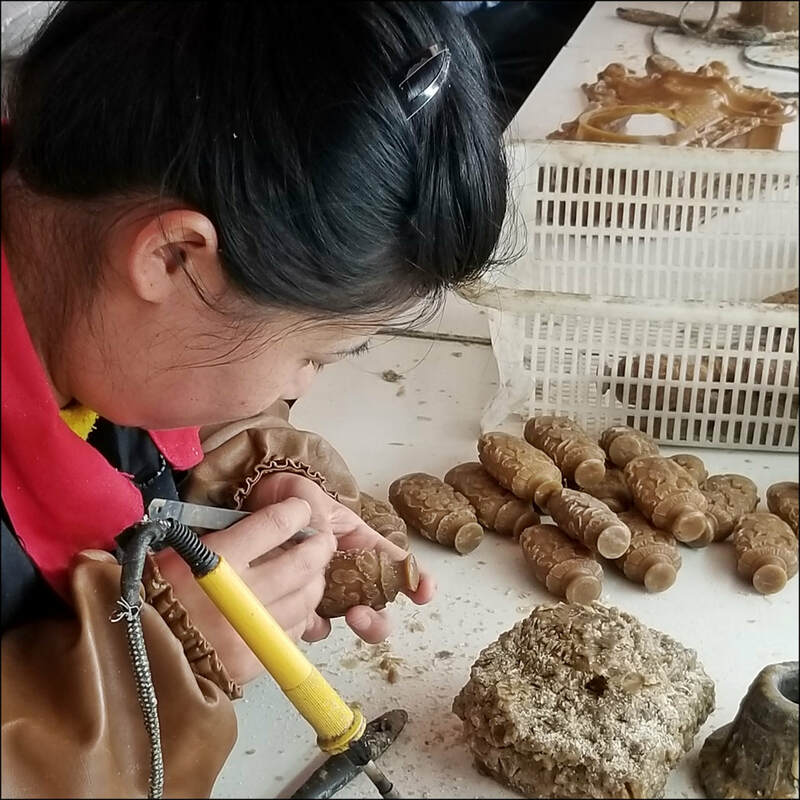 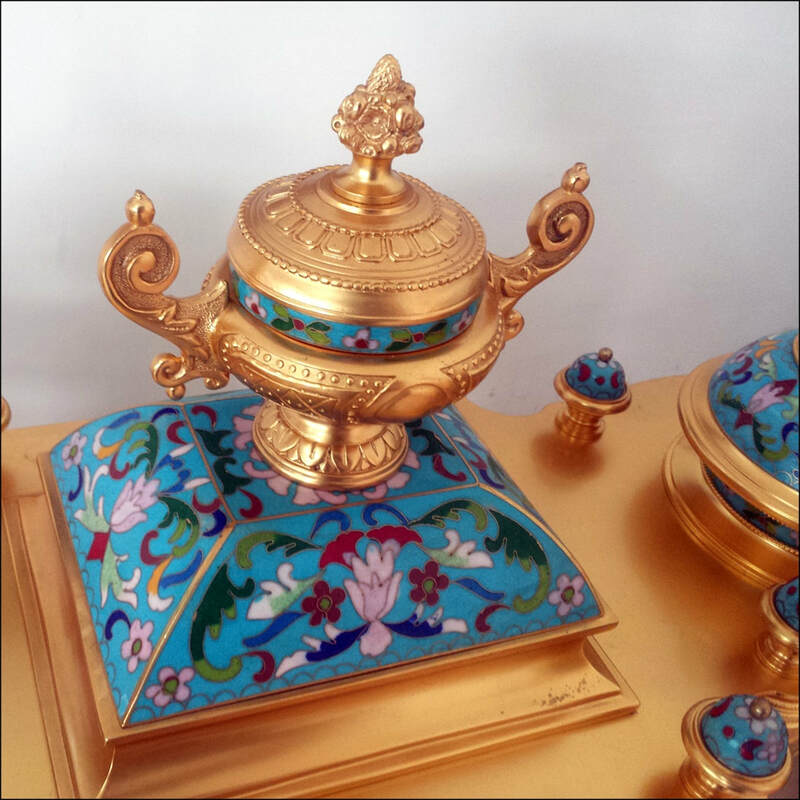 (Tourism stuff in Liaocheng and the visit to the Shandong Liaocheng Zhong Tai Watch Company (Taishan) will be a fun and full second 2018 Liaocheng post). 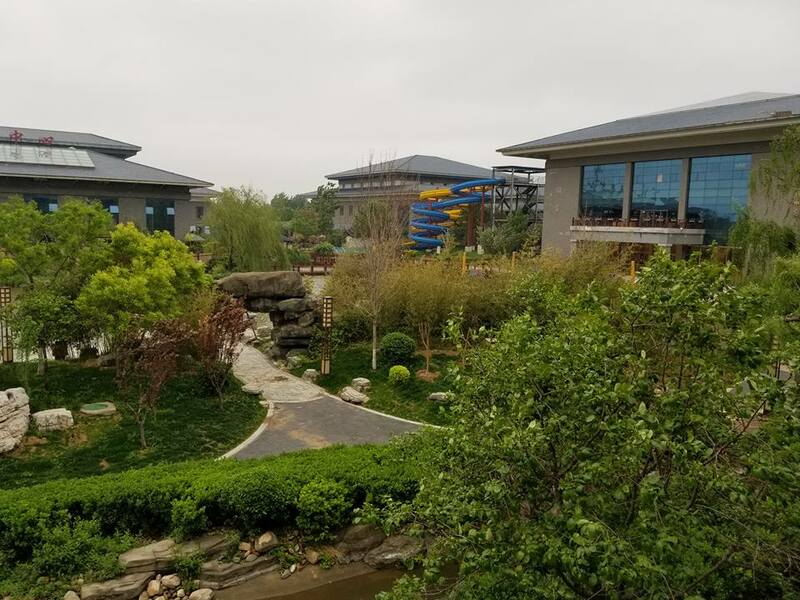 On The morning of April 24th/2018 Mr. Ma and I drove from the hotel to the nearby Shandong Langelo facilities in the Dong Changfu District of Liaocheng. The factory started life as the KaiJian Copper Art factory, and was renamed Shandong Langelo after 2o years operation under the former name. 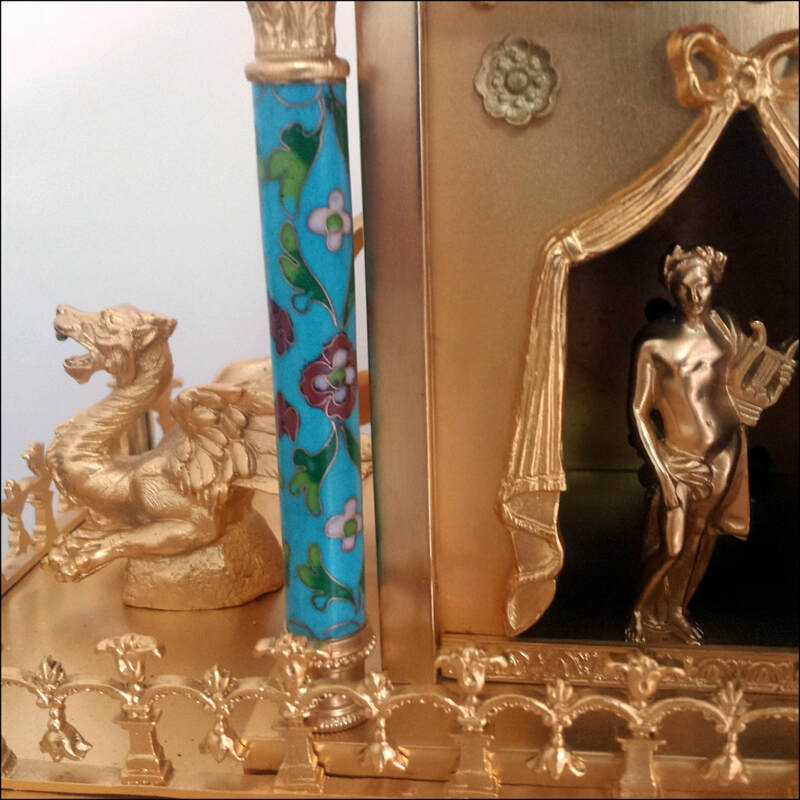 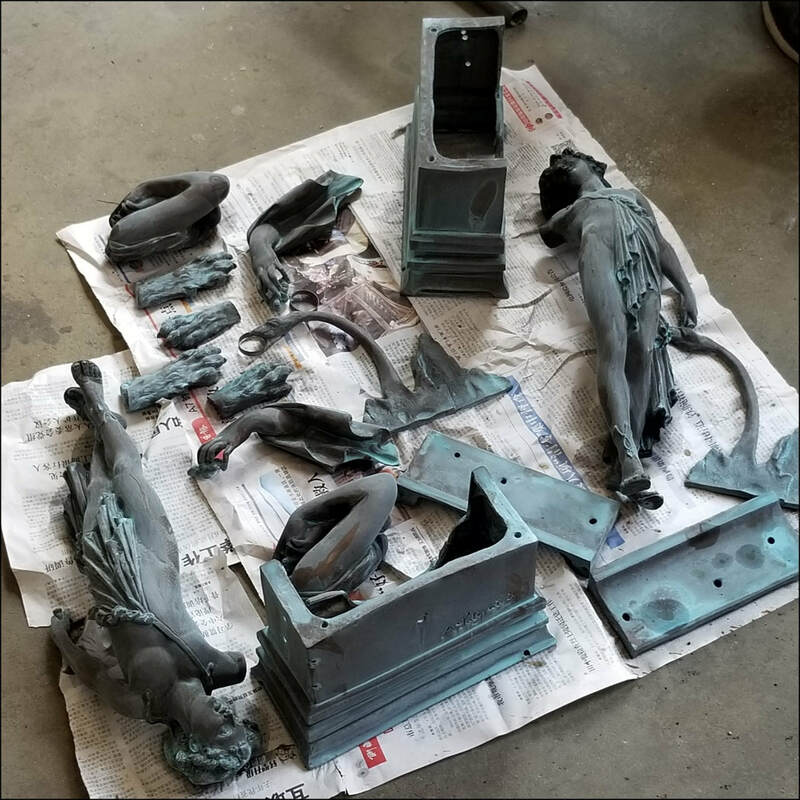 As I noted earlier, all molding, casting, finishing and gilding is hand-done. 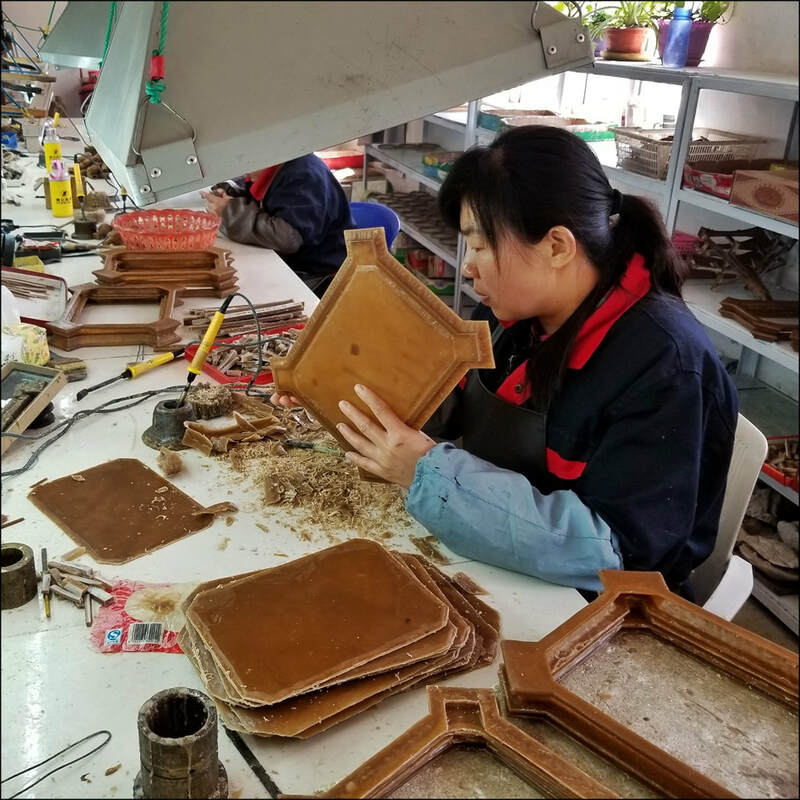 The facility employs 60 workers, 10 experienced craftsmen, and covers an area of 6500 sq. meters. 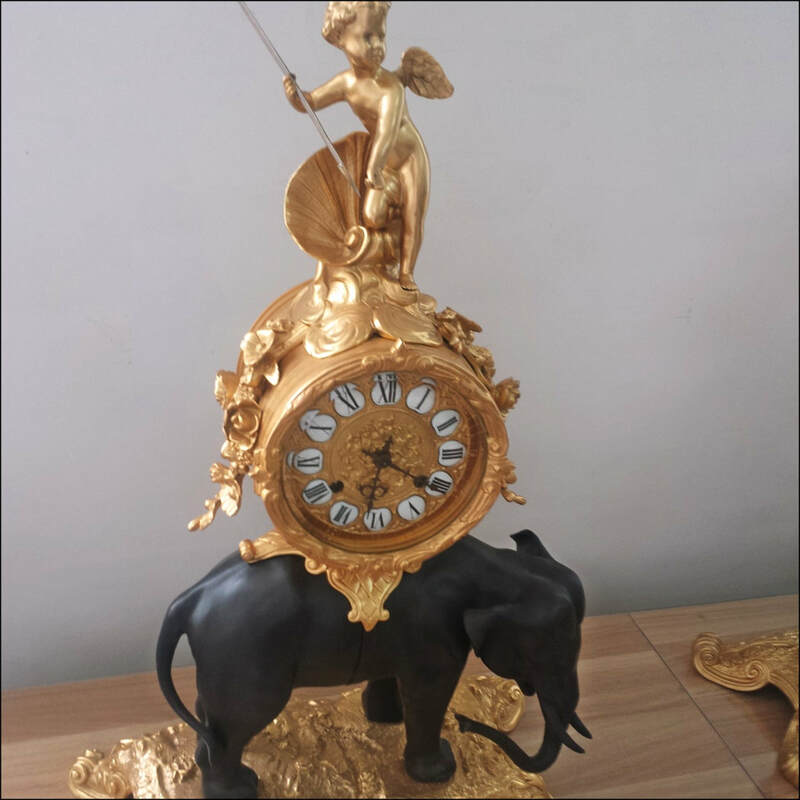 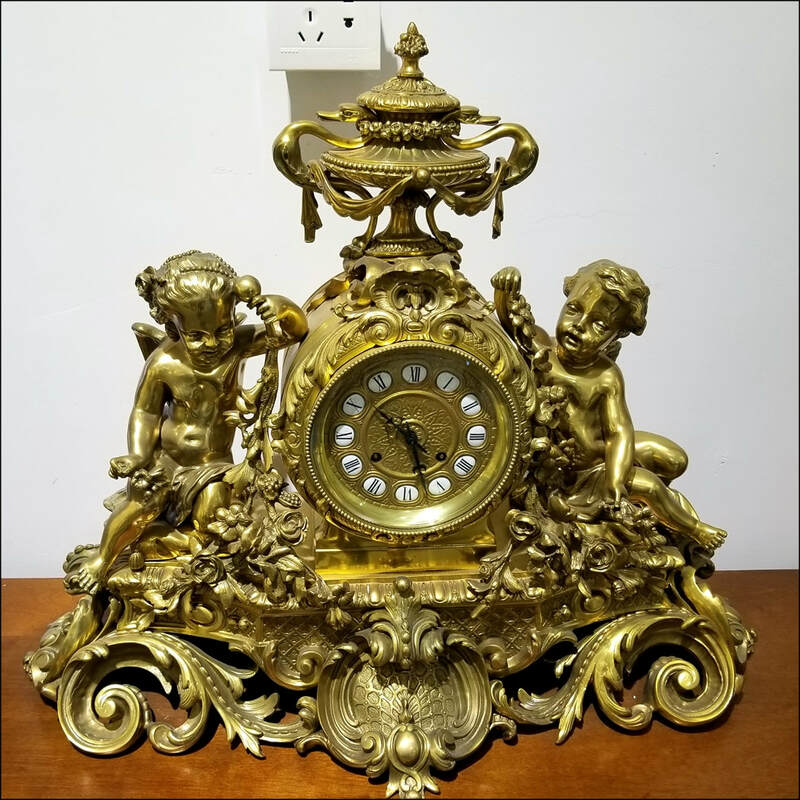 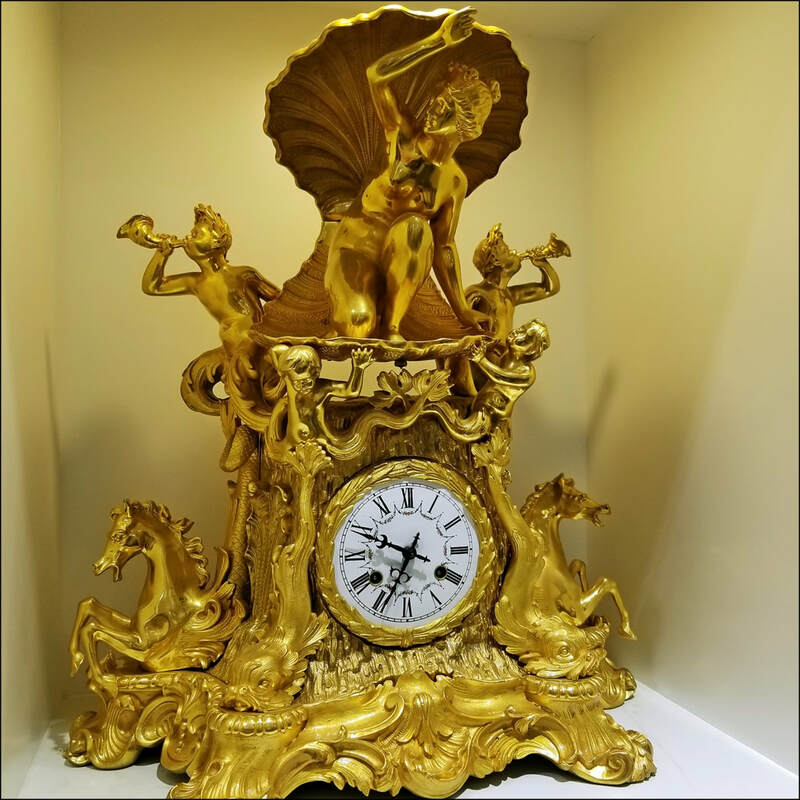 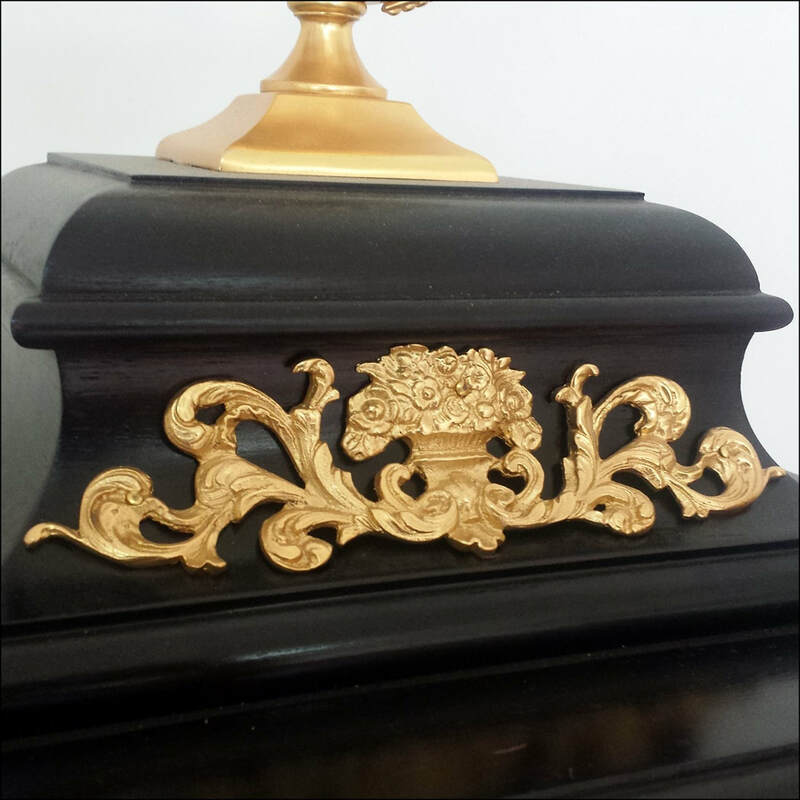 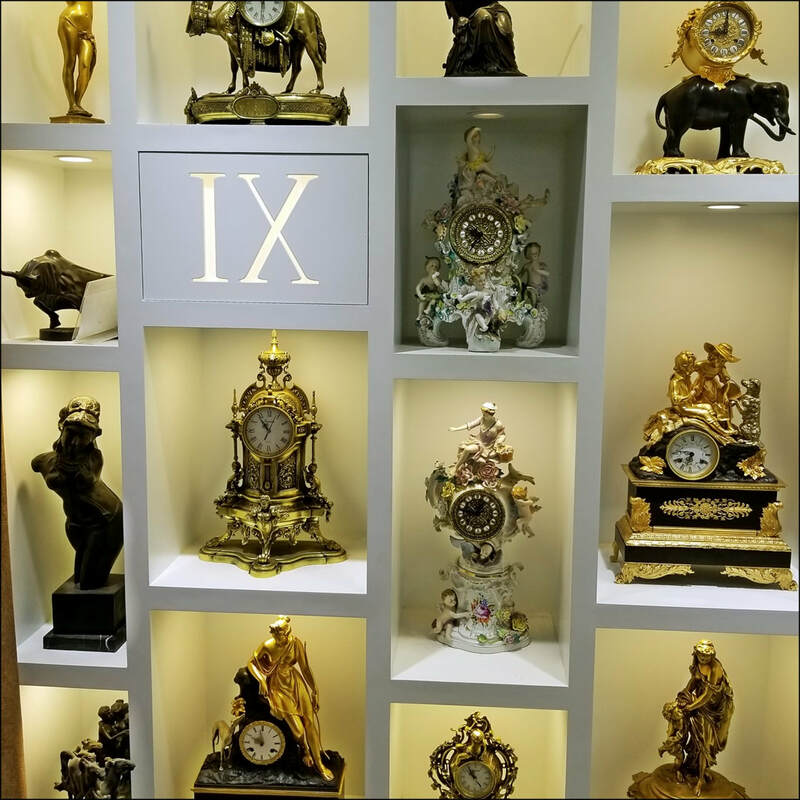 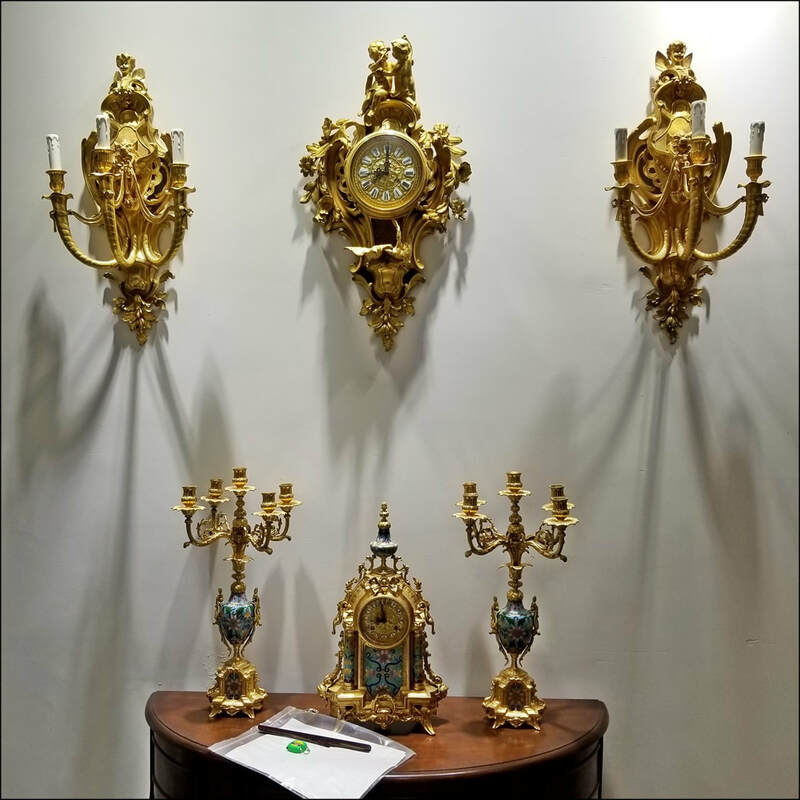 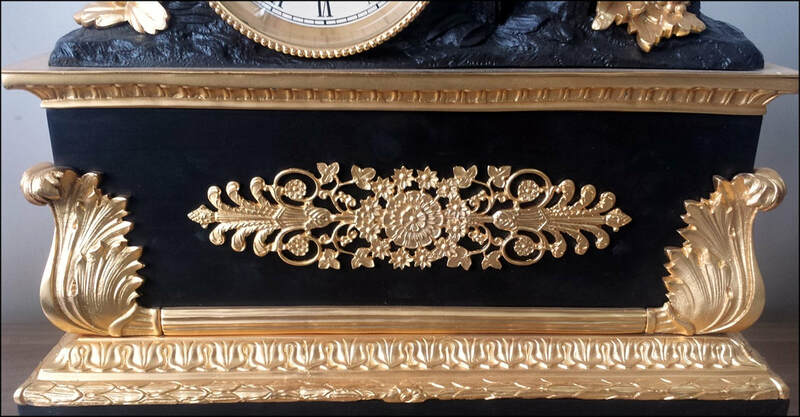 Products include (from their documentation) "European-style clocks, copper sculptures, candle holders, wall lamps and copper accessories." 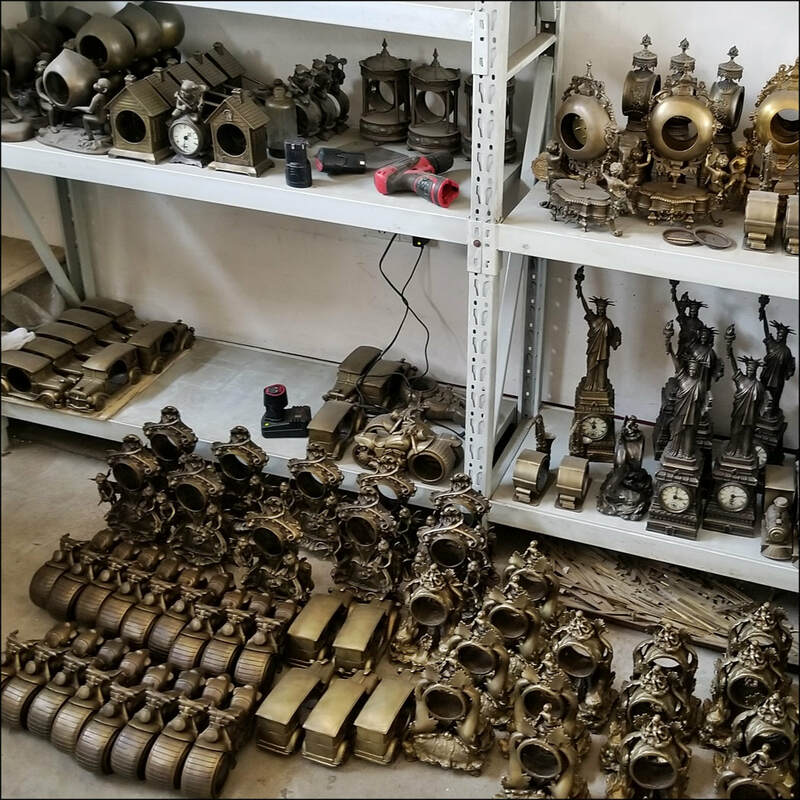 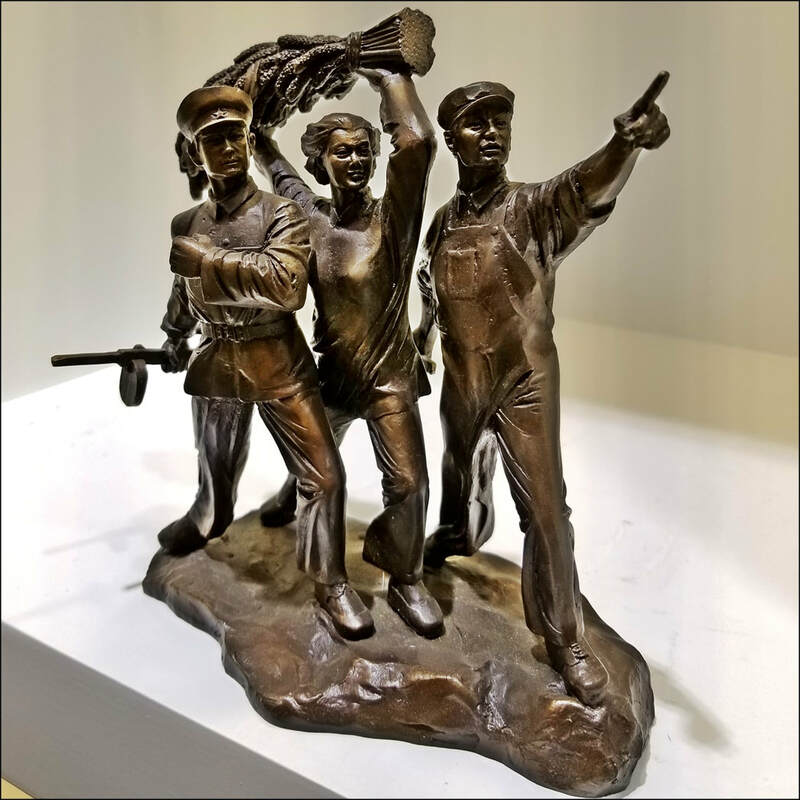 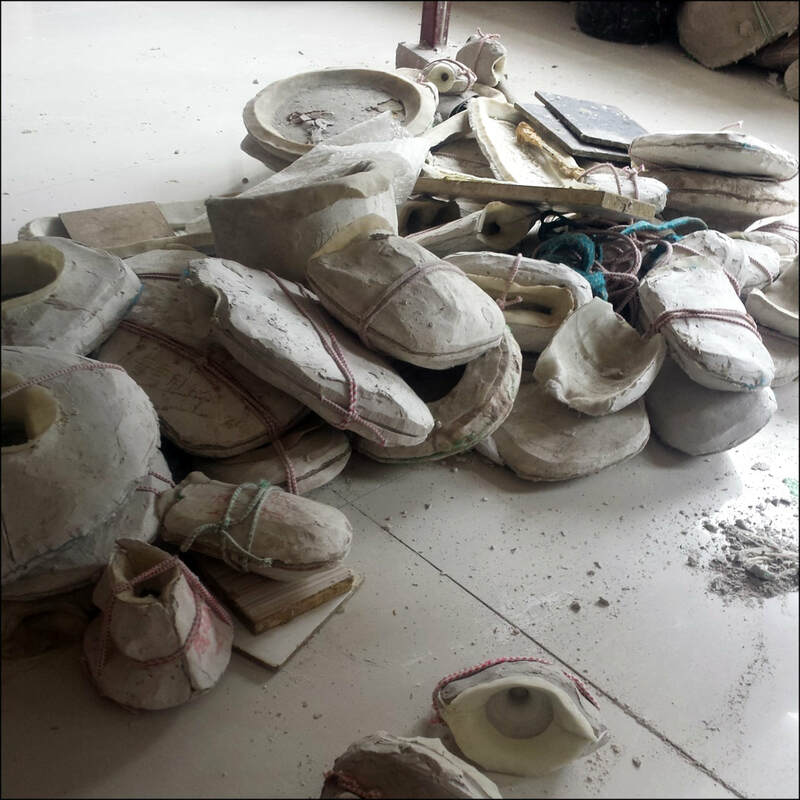 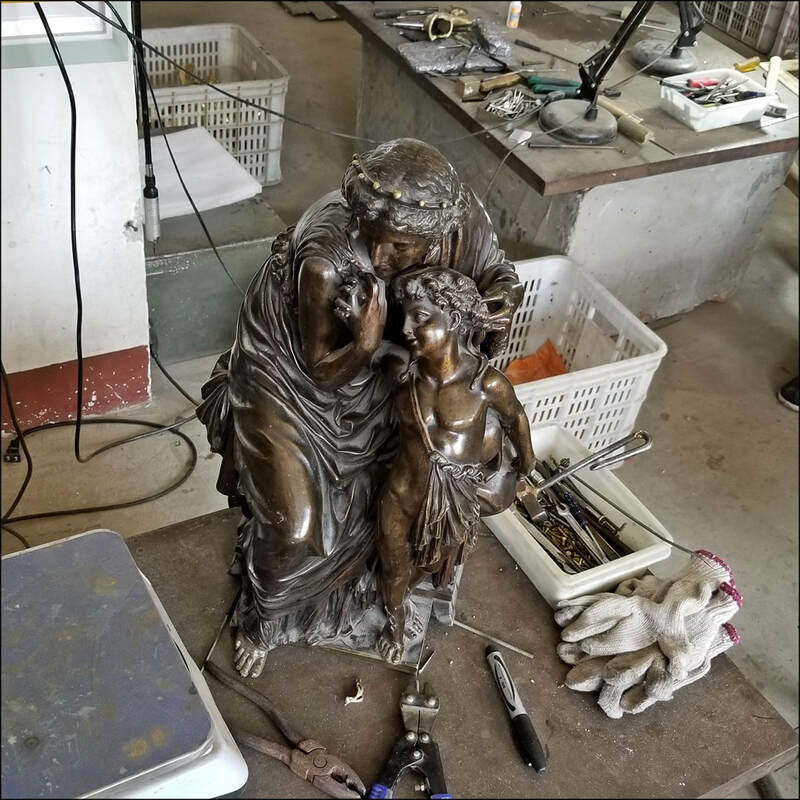 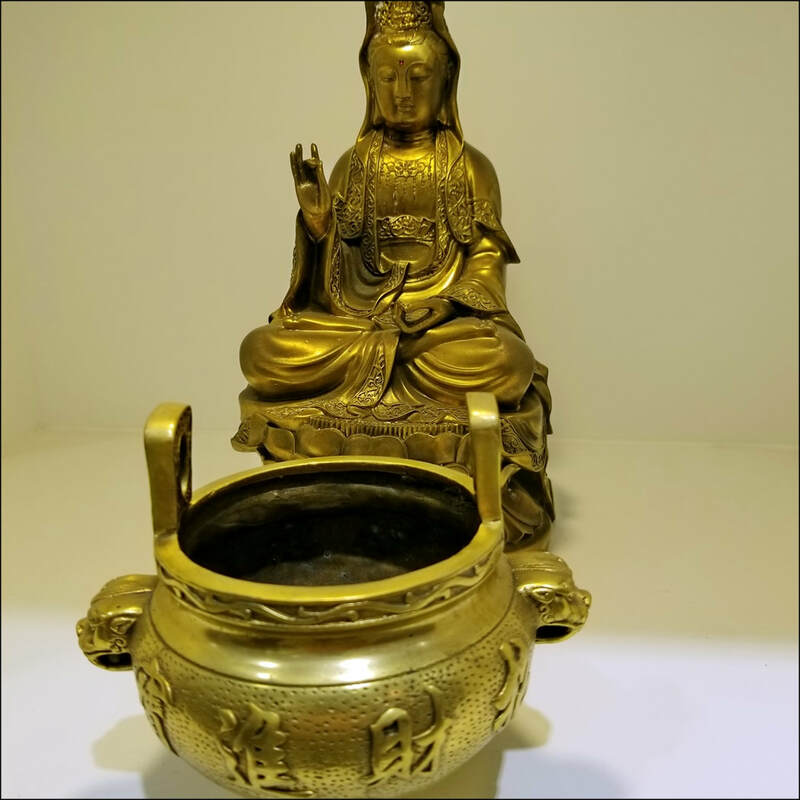 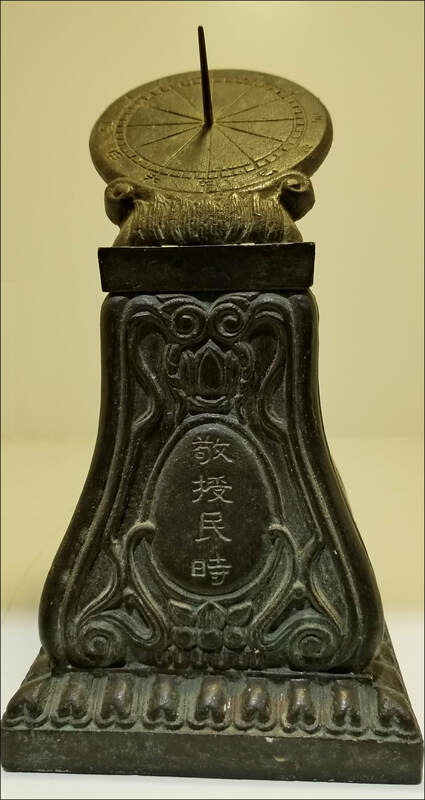 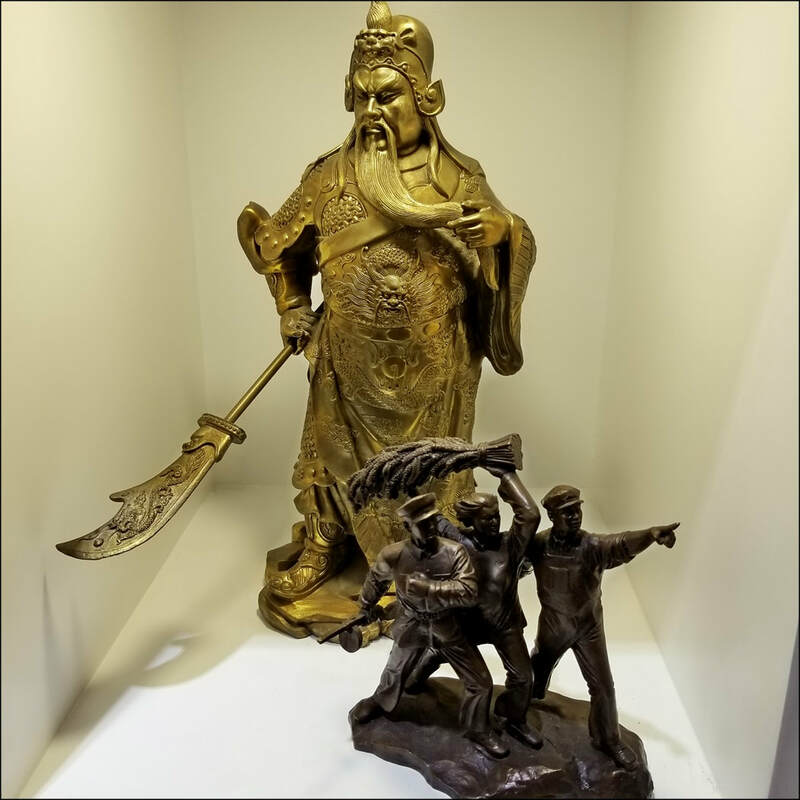 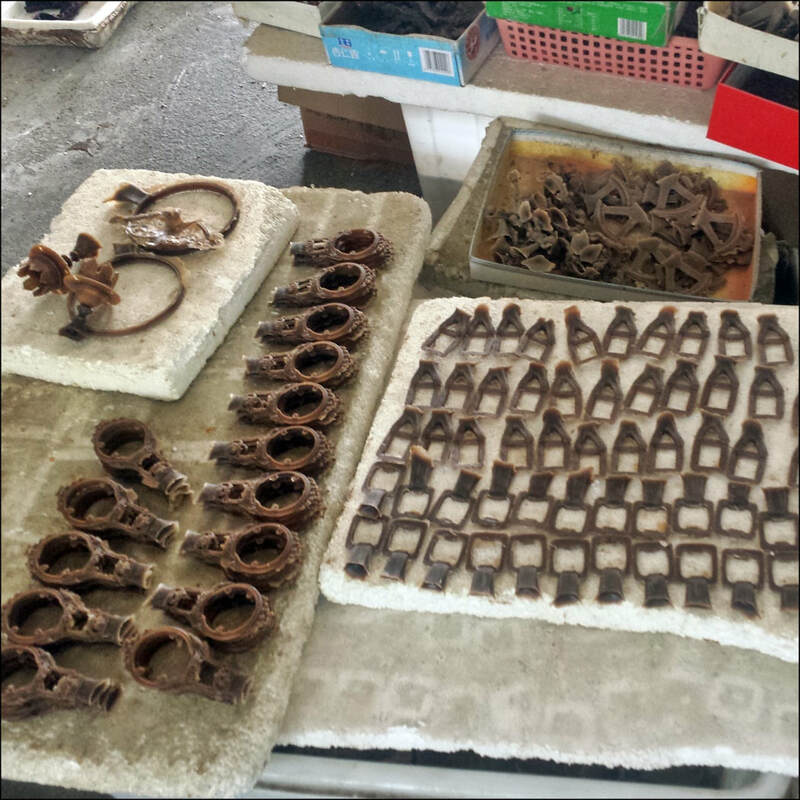 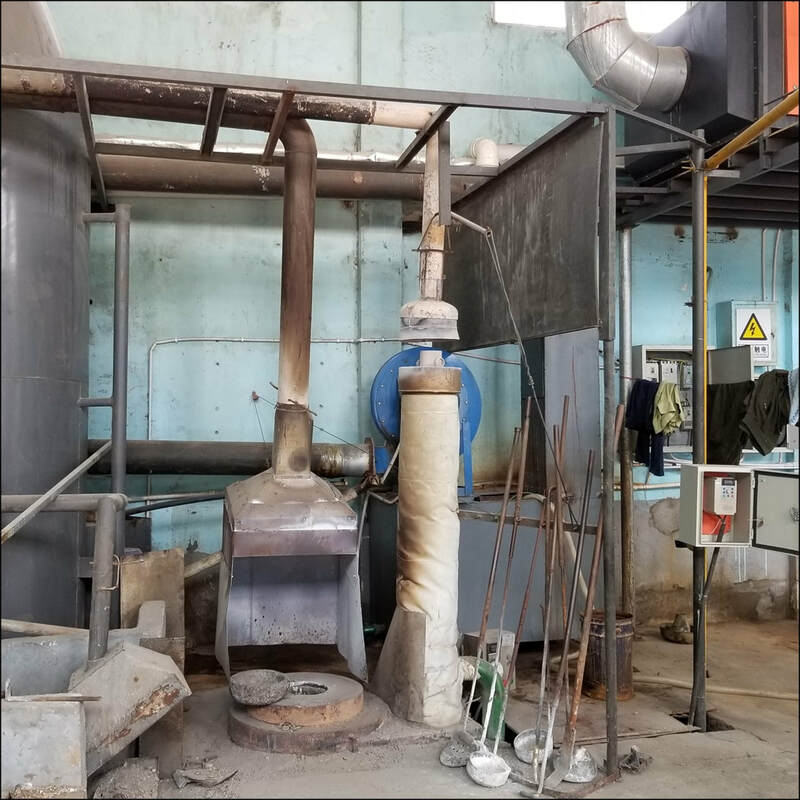 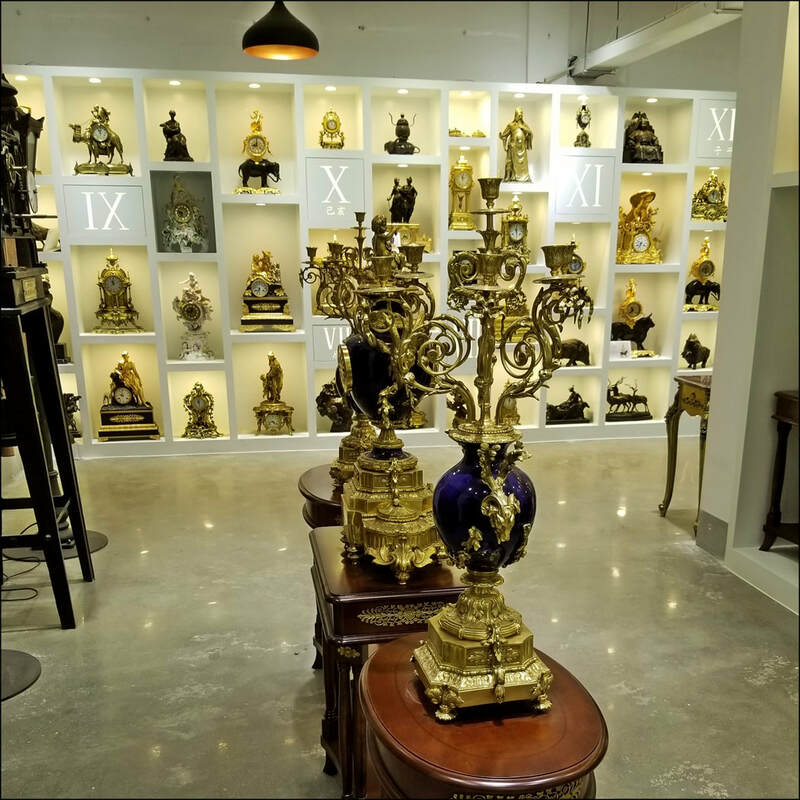 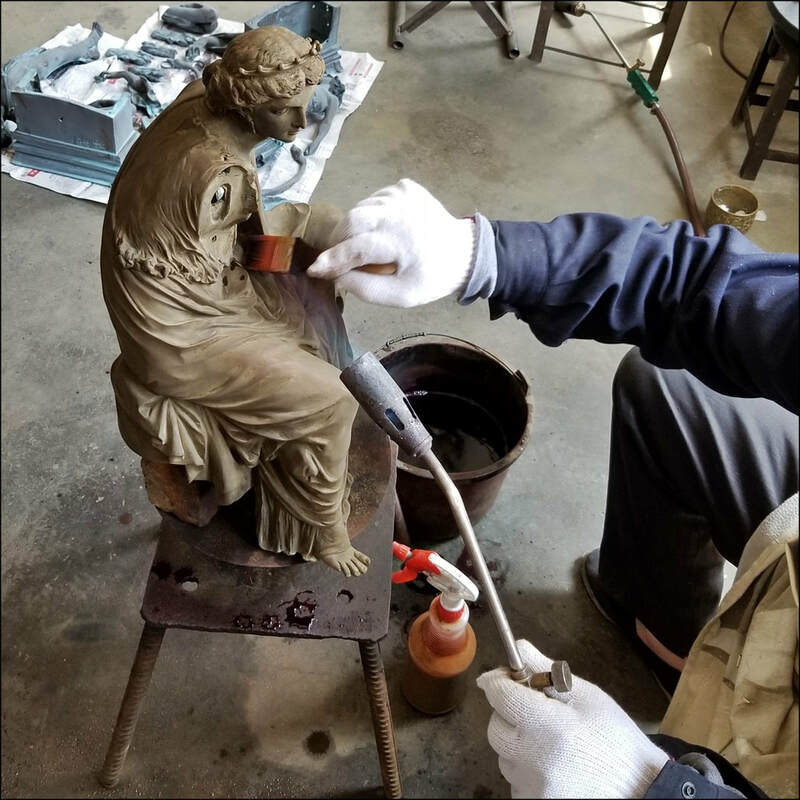 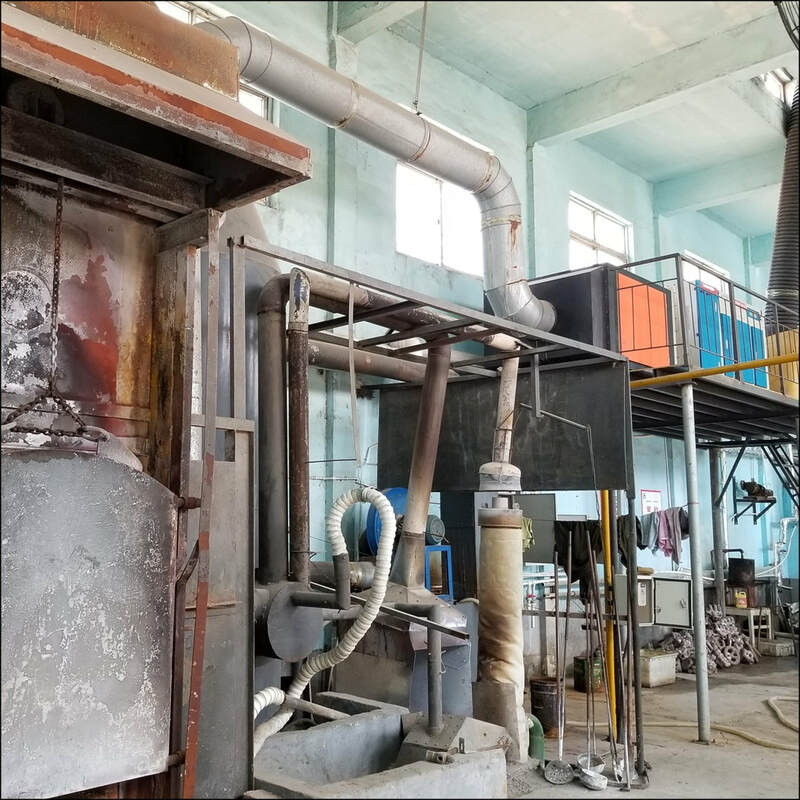 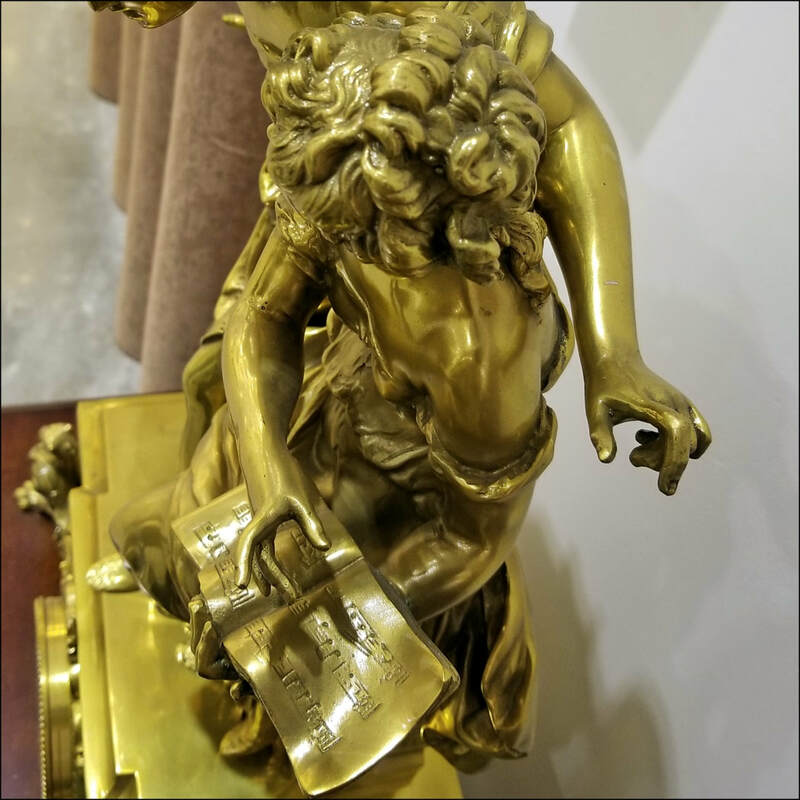 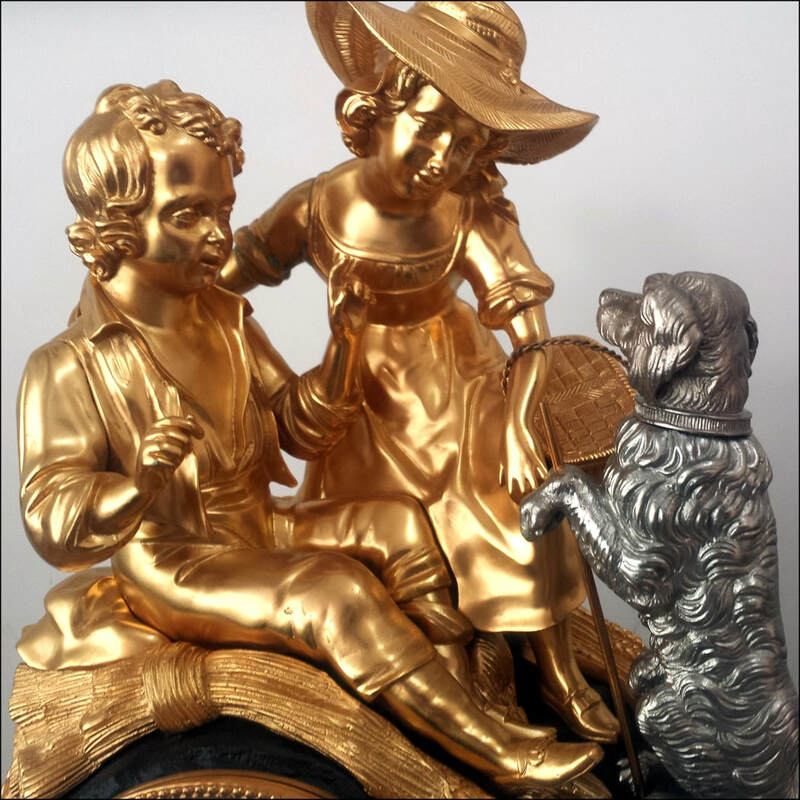 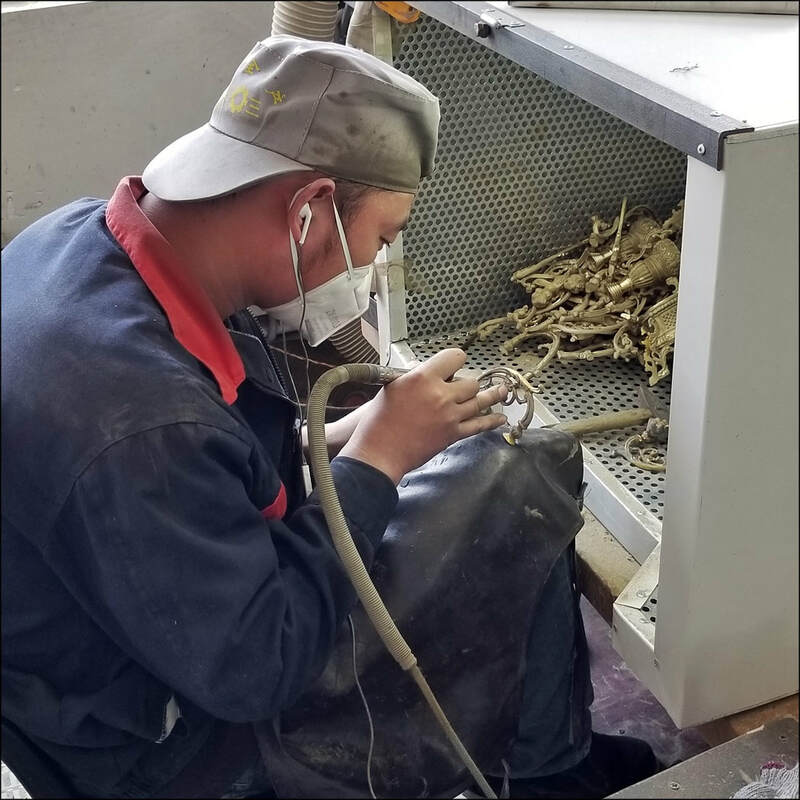 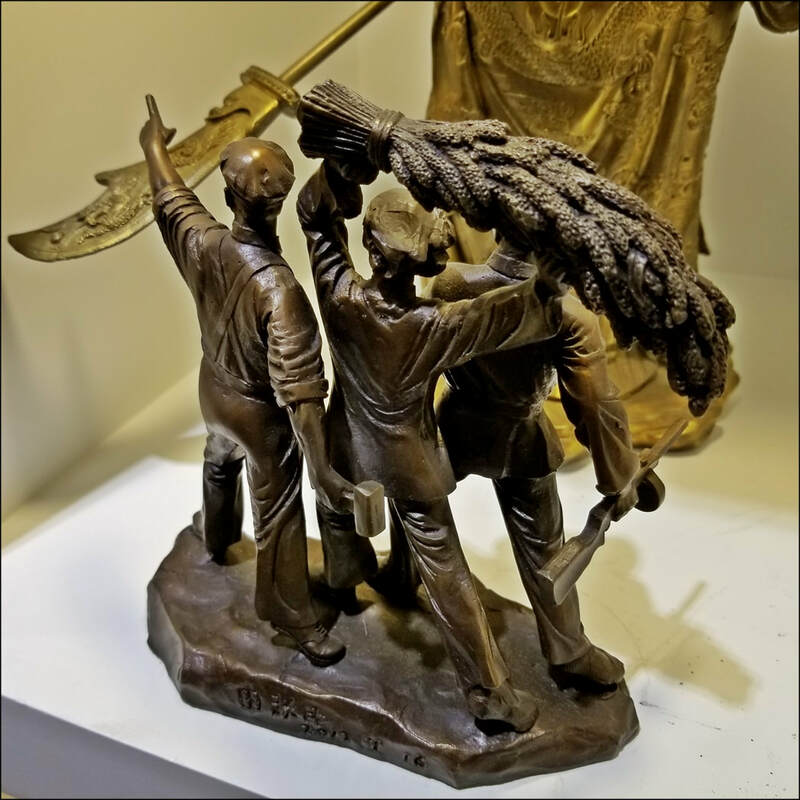 I don't pretend to understand all the steps in lost wax casting but the link provided explains it, and its history, in some detail. 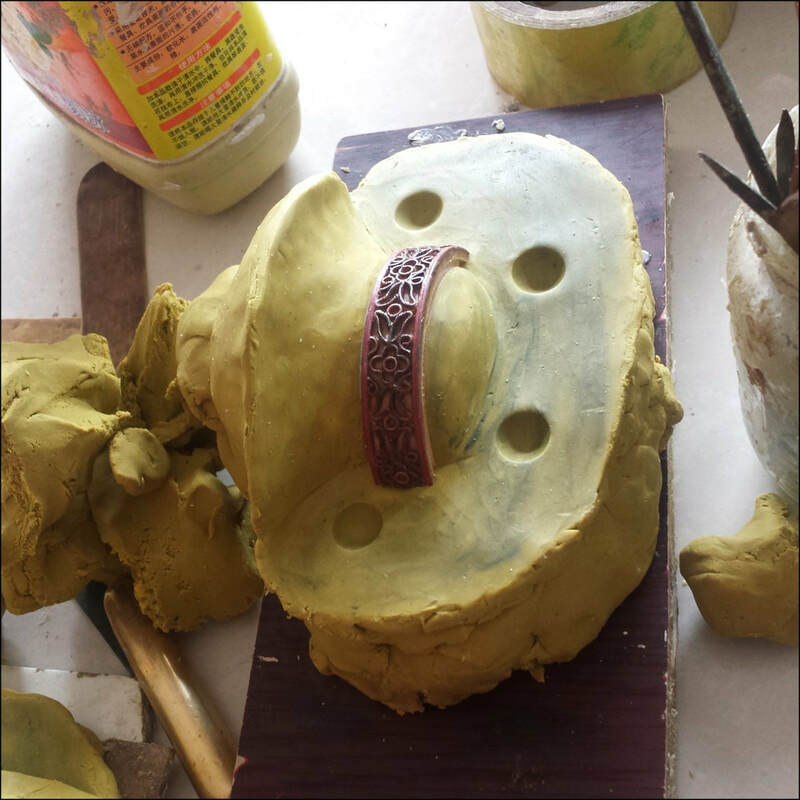 I'll start with photos and videos of the process, and then provide photos and videos of the final, spectacular , results. 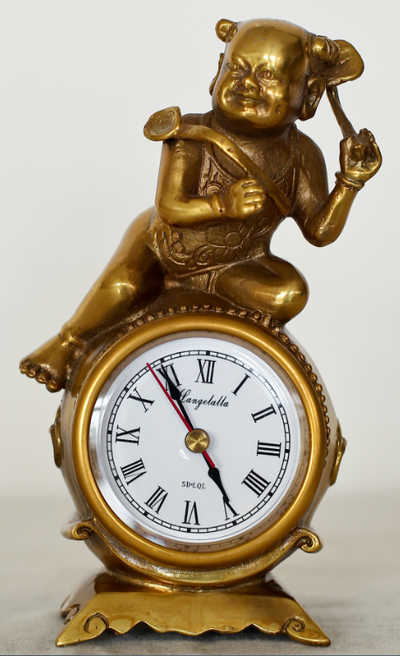 Click any photos to enlarge. 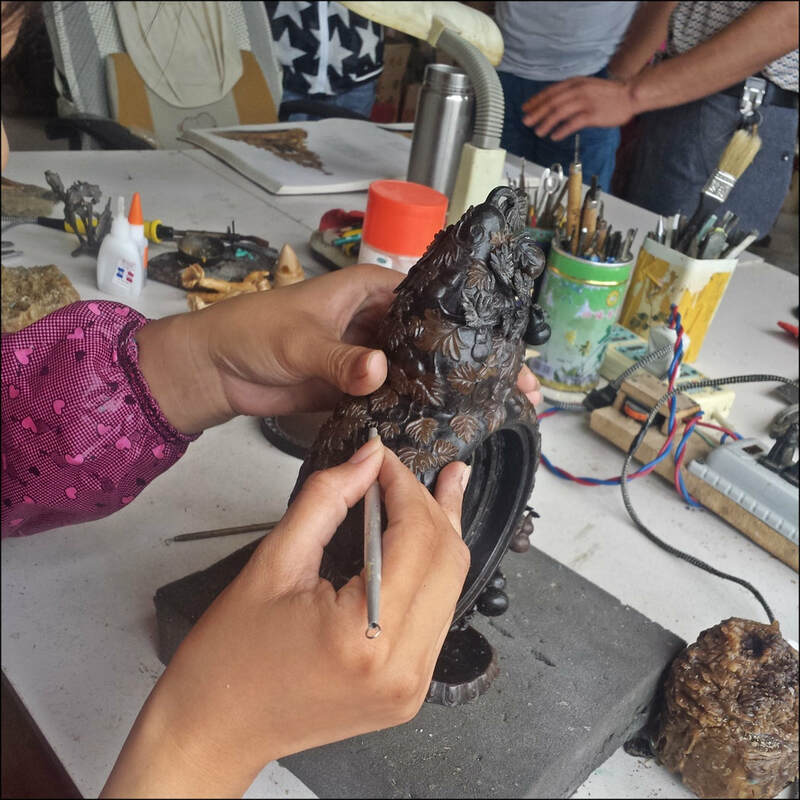 Creating and finishing the original wax models. 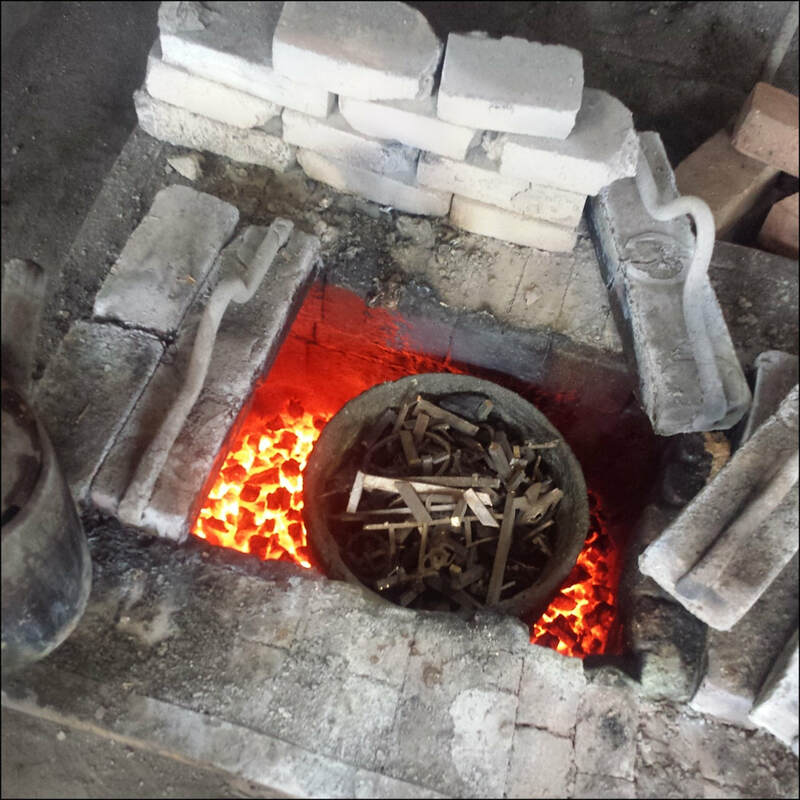 Yes, I got to try my hand at it, too. 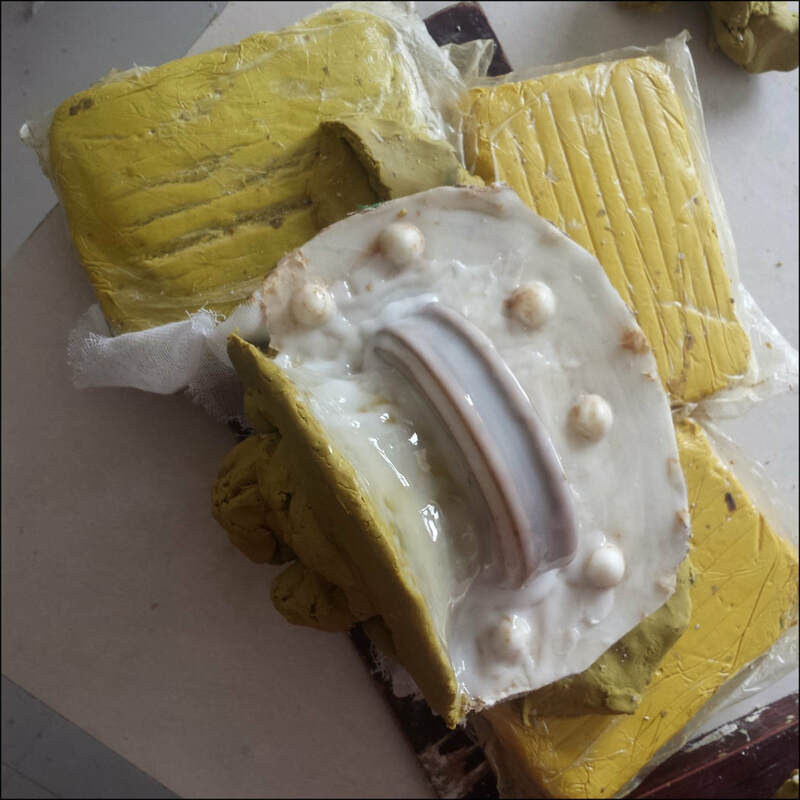 I'm terrible. 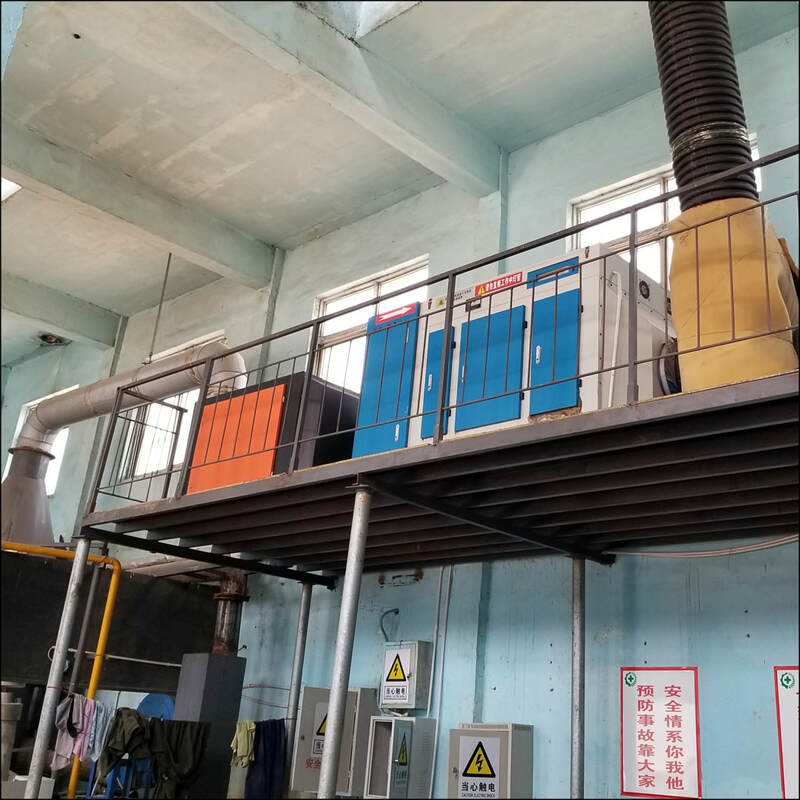 The result is that processes like this now vent efficiently and cleanly, a benefit to workers as well the surrounding communities and the general environment. 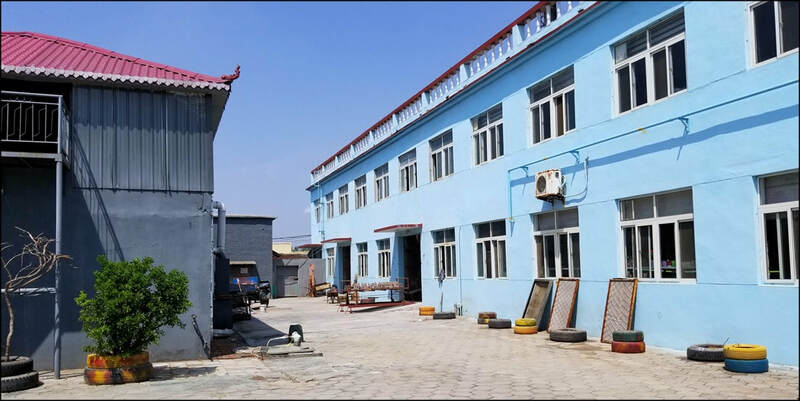 Following this very complete tour of the facilities, Mr. Ma took me to the roof of the complex to show me more of the environmental improvements. 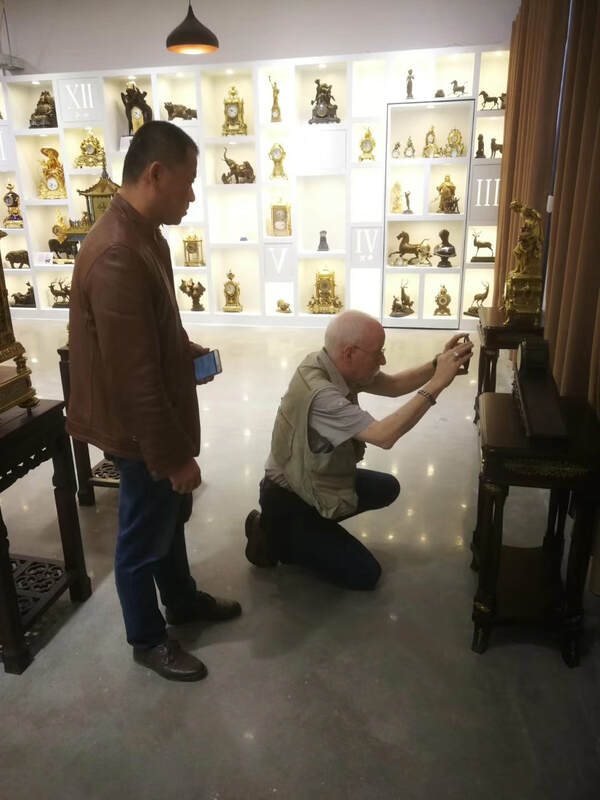 While there, Mr. Ma also explained to me more fully the impact of the business on the community of the Dong Changfu District of Liaocheng as an employer and, more broadly, as a responsible neighbourhood citizen. 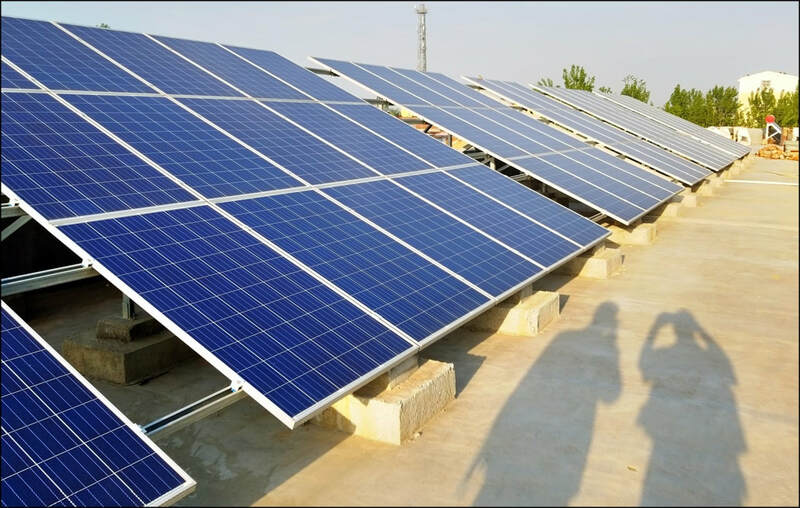 I'll begin to close this post with photos of the new solar power panels, and if you look closely, you'll also see solar hot water equipment. 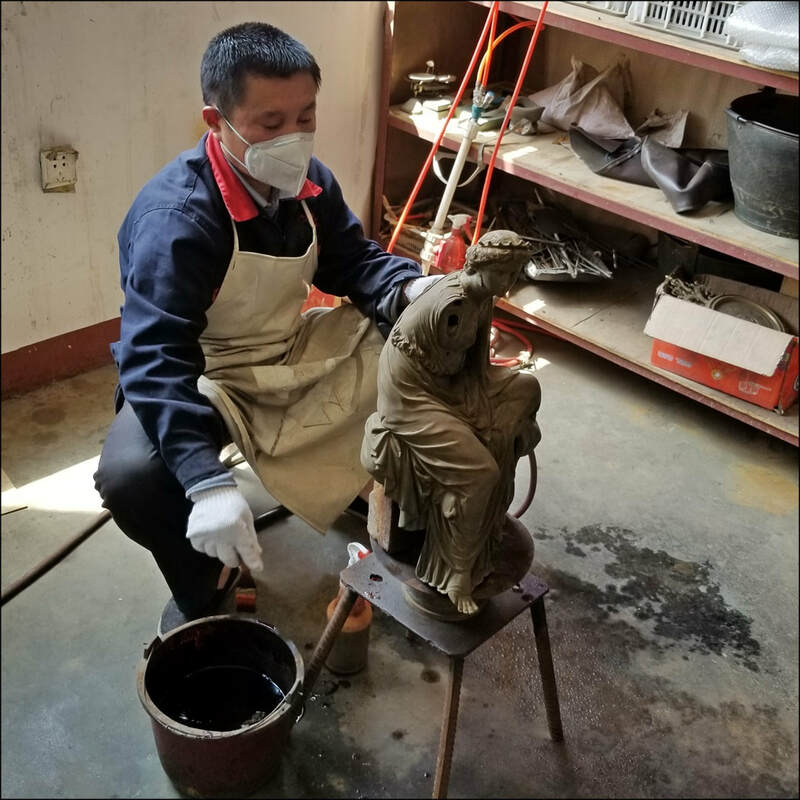 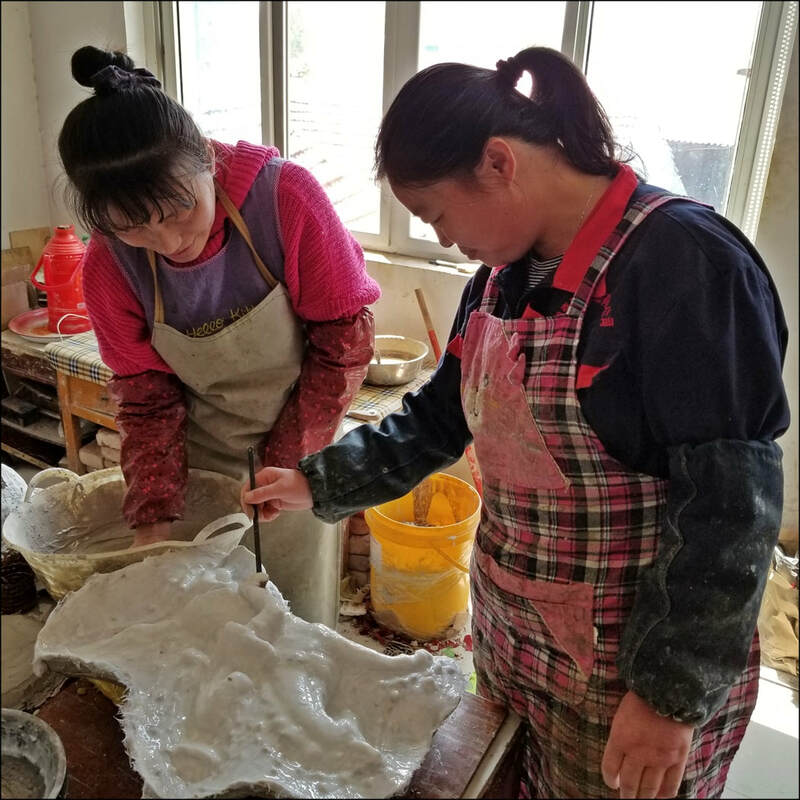 Thank you very much, Mr Ma and all the skilled and friendly employees of Shandong Langelo Arts & Crafts for your many kindnesses and your understanding. 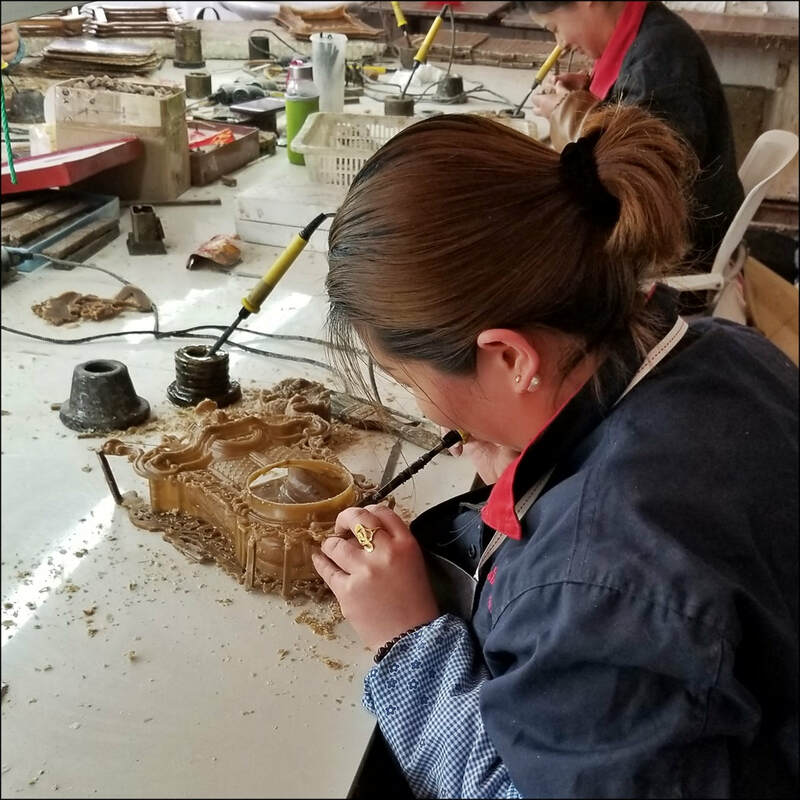 As I noted on my first visit: "The beauty of old processes brought to the modern world - a gift of much value" and as I noted this visit: "Always high quality and always improving!" 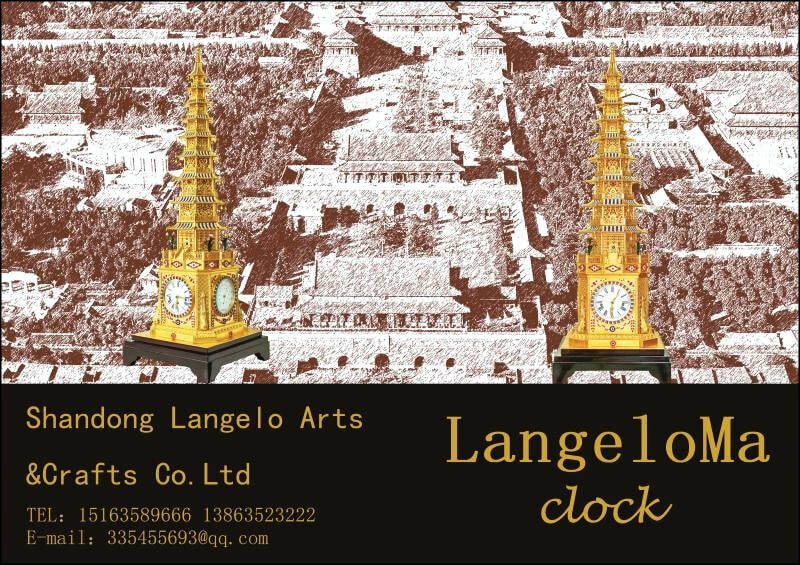 The following proprietary promotional photos are Copyright Shandong Langelo Arts & Crafts Co. Ltd.